4 a.m. “Beeb-Beeb…Beeb-Beeb…” my eyelids feel glued together. My hand unconsciously grabs the round edged phone, my finger slides over the cold smooth surface, finding the snooze button. Silence. …until a growling Thunder! moves over my head. My heart rate jumps, my eyes open and a deep breath fills my lungs with air. I slowly exhale while I sit up on the edge of my bed. My daughter sleeps, I give her a kiss on her forehead and put the cover over her shoulders before I leave for the kitchen. While the water is boiling and the eggs make their dancing sound on the bottom of the pot, the bitter nutty smell of fresh coffee fills the air. After abstinence for about one week I close the eyes to enjoy the aroma. 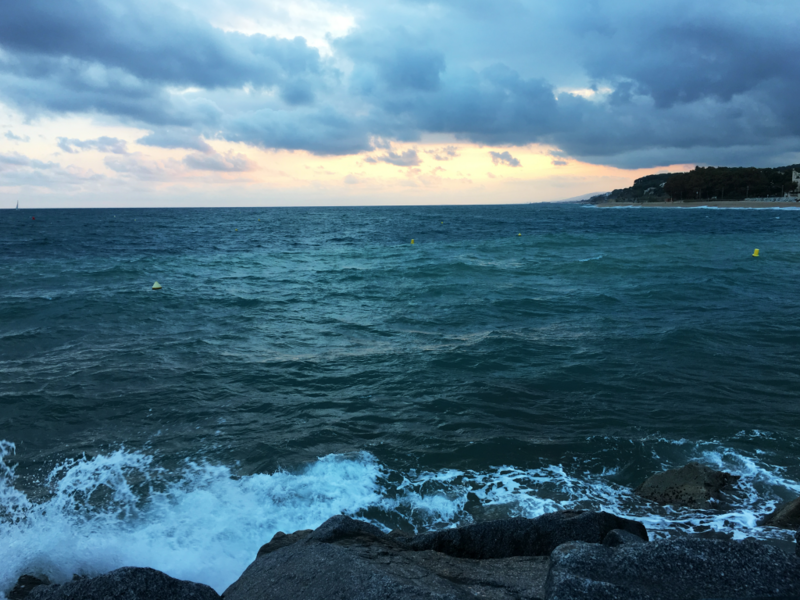 Standing in front of the window with a the coffee in one hand and some Catalonian sweet from the tiny local bakery in the other, I watch the sea light up under the giant clouds, when their lightning is bursting down. I put the small ear pods into my ears and turn up the volume of my raceday playlist. A shiver runs down my spine and my hairs stand up with every thunder growling over the sea and every lightning lights up the smile on my face too. This will be my stage today. A sweet candy like smell fills the air while the carbohydrate gel slowly flows into the bottle. Following my nutrition plan on an excel sheet as colourful as a production plan I prepare my hydration and nutrition, carbohydrates, sodium, caffeine and water for the race, calculated on my swetrate sodium loss and carbohydrate needs. Remembering my strategy, to rehydrate every 20 minutes and load carbs in the same interval but with a 10 minute offset. The body hair makes a distinct sound under the sharp blade cutting it before it falls down on to the hand painted tiles of the floor silently. Like in the old days. I am thinking of greek and roman athletes, pictures of Jean-Léon Gérôme. The vibrating sound of the old electronic shaver is not half that romantic and safes me from dreaming away. The cold water of the shower is the first reminder of what lies a ahead of me. The cold mist in my face helps me to wake up while I am running along the coast to warm up. Warming up in the cold, dressed with a suit weighting just a few gram. The wild waves are crushing against the rocks. Their power is humbling. I am thinking of how I was coming out of the water tumbling, hardly able to stand on my two feet after just 20 minutes of easy swimming. I can already taste the salt in my mouth. This will be my first proper open water swim in the sea. I rush to grab my bag after the run as my cab is already waiting next to the house. Jumping in to the car, my mind races, trying to visualize all the things I should have packed and mentally checking them off the list. I sit in the back on polished leather seats, breathing deeply, inhaling the typical car smell. We do not talk and even the noise of the radio does not really reach me. Just a few moments later I am looking on streams of athletes with white bags, walking through the streets of Calella. Their faces explain how a focused mind looks like. I am excited. I have to pull my self together to not dance through the streets to the music in my ears. Some of them seem to be puzzled when they see me smiling all over my face. I enter the transition area to load my bike with my nutrition and hydration. Installing the Garmin at my cockpit, checking my brakes, gears, tire pressure, seatpost and handlebar screws. It is all set, ready to launch. I got way to much time at my hand. I am walking around marveling all the haywire. Just before the sky opens again, I enter the transition tent and around two thousand athletes right after me. I start to squeeze myself into my wetsuit. Admittedly the procedure taking easily up to ten minutes until I feel comfortable with my underwater superhero costume, is not the most elegant. The show helped an athlete next to me over his uptightness. I smiled back at him. He showed us first timers, as he called “us” how fast he gets into his loose-fitting suit within a blink of an eye. I admit that was fast! I promised him at least an equal level of entertainment when I will try get out of my second skin after the swim, if he manages to keep up with me. Laughter, I have successfully loosened up the mood for the others around us. I did not saw him again. Like black pillars athletes stand at the beach next to the sea, preparing, fitting their goggles and seizing the the course with their eyes. The feet dig deep with every step. The wet cold grainy sand sticks to the skin. The waves are still building high walls with white crowns. We walk, run and jump into the salty cold water. Some athletes are carried back to the beach by the sheer momentum of the waves. I dive into the water, accelerate and try to find some rhythm. Warming up, I flood my wetsuit. I am not sure how to swim in these waves and how to navigate but I am feeling good. Epic drum music plays as thousands of athletes line up at the beach. Drones are watching. The commentators voice is trying to find the athletes ears. The anticipation is at it’s peak. Excitement, doubt, nervousness and focus is written in the athletes face around me. I am smiling. I tried to move forward in a crowd of black pinguins. Some are trying to get their goggles right, others swing their arms or do some last squats, most are intensely focussed, some joking, others nervous and some are celebrating their level of adrenalin and anticipation. Suddenly I am standing right in front of the arch. off we go, six Athletes at a time. The waves seem to push me back, slowing me down and not allowing me to move forward. Straight against the tide. After a few moments I get the rhythm, fast strokes at the building up wave and a bit more gliding down into the valleys. It still seems slow. Where am I? How far is the next buoy? I look out of the water and see… nothing, just a hill of water in front of me. After the first buoy I got a good feeling when I am at the peak of a wave to look out. But I do not need to as I just picked up pace and start to follow the bubbles. I am not rushing past other swimmers but I take over continuously. A pleasant feeling of butterflies running my stomach and a super salty taste in my mouth I fly through the water with a smile. I did not see the ground, I could not see to far ahead, there were no plants, algae or anything, I only passed one jelly fish and quite some weird looking fish with mostly black, sometimes gold, yellow, orange and red neoprene skins. 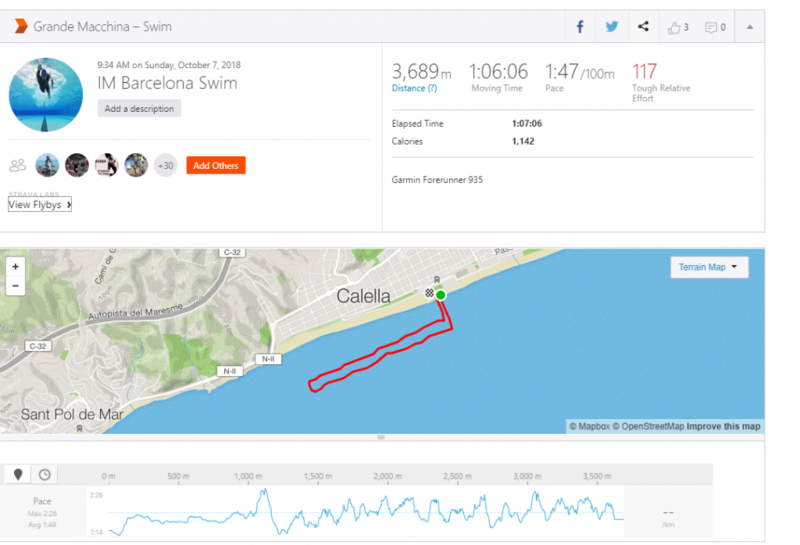 Beside some elbows, a guy hitting me and a couple of times that the waves seemingly stacked swimmers on top of each other, the swim went by uneventful. Still I came out of the water after that 3800m swim with a smile, thinking that this was the most enjoyable and interesting swim I had so far. I think I catched a tail. Will not be the last time in that race. The first few steps I was tumbling, I think after 3 steps I felt my legs would just give up under my weight. A guy catches my arm firmly and balanced me. Thank you. After running up the beach, I catched a bottle of water, flushed my mouth and spilled the rest over my face. I got out of this skin way better than expected. I wipe my face dry, slip into my socks and shoes and put the helmet on. Most of the field seems to be still in the water as the bike park is still packed. A new high of anticipation builds up as I run out of transition and mount my bike. 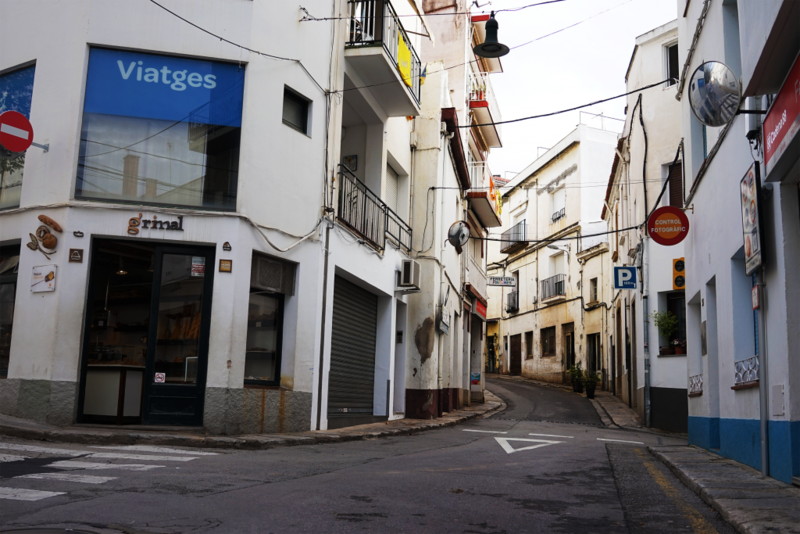 The first few kilometers are technical and aerobars are forbidden as we move out of the old city of Calella. The roads are packed with people cheering the athletes. It starts with a light ascent. My heart rate is way over what I should be doing but I attribute it to my swim and keep pushing. Contrary to the weather forecast, predicting rain all day long the sun is out. 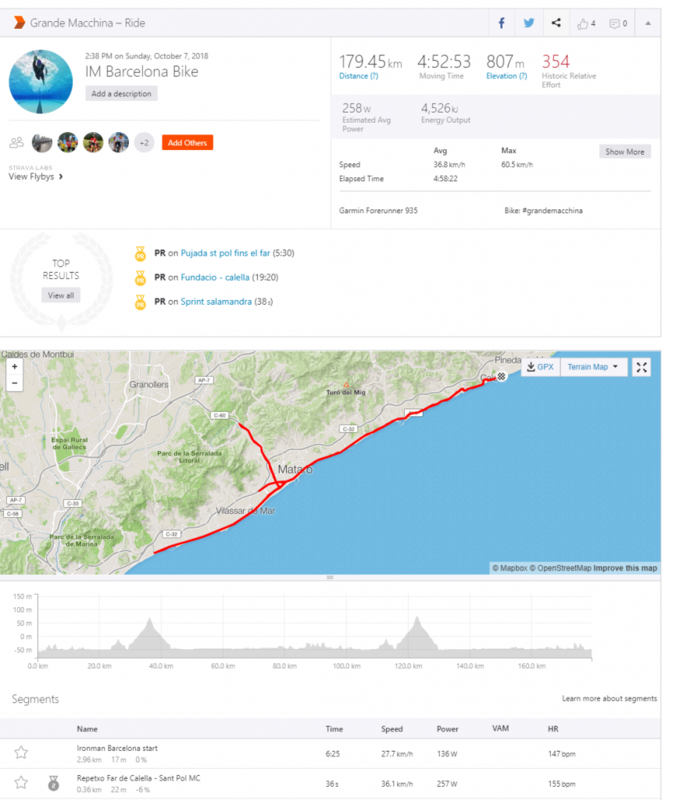 We climb up to Sant Pol de Mar, where I have been staying during these days and start pushing the speed down along the coast. Palm trees on one side, the beach and the endless sea on the other. I never got into the rain, but there must have been some certainly as the the roads are often wet and sometimes huge puddles along the way. There are quite some roundabouts in the course and the tarmac turned out to be quite slippery when wet, to the mishap of some, even pro riders. I draw in my pace zones and keep pushing forward. I take over one by one or pack by pack. They ride in questionable distance to each other (minimum distance to avoid drafting is 12 m) and I really want to avoid any penalty because of drafting. I push my pedals hard again and again to get by these packs. Just to be the train for them, until I have recovered to be able to kick it again and leave them in the dust. It might not have been the most effecient strategy but satisfying my racer heart. Since Barcelona Ironman has changed the course it now offers some elevation at middle of the first loop. Back home I have no climbs to train but dutch mountains. Somehow this might be quite effective as I tend to keep my speed up way better then most of the riders and still have enough in my legs to kick up the speed at the tip of it, before recovering on the way down. Shortly after the descent my legs have recovered and I dial in to my rhythm. My left shoulder starts to complain about a piercing pain. I am not sure where it comes from but it hurts. To relax the muscle I put my left arm on my back while remaining in my aeroposition riding only leaning on my right arm and pedal on. I keep the speed up, stabilize with a more focused core. The spectators are clearly wondering, a small boy pointing at me while obviously asking his mother about my doing, if this is an attempt to be even more aerodynamic? After about three to five minutes I am able to get back into a normal aero position. Repeating this procedure every 30 minutes I am able to cope with the stress in my shoulder muscle. I might have been a bit over my zones, my coach defined for me but I felt good so far. I am alone again, as most of the time on the way back of the first loop. Suddenly a pack swamps me from the back. One by one they overtake me, sitting back in right in front of me and slowing me down. About 20 riders and I have no choice to than let them do their thing and wait until they are done. I am upset. As soon I have no rider behind me anymore I fall back to get the 12 m distance and accelerate full power taking over the whole pack at once. all of them. Right behind me they stick. I calm down and then try to get away. They take full advantage and keep sticking to me. Suddenly a fresh rider, not of this pack I am dragging with me takes over, sits back in in front of me, slows down. Before I realize what is happening, a motorcycle comes by from the side. They have been right behind that rider. The referee shows me a blue card. I am speechless. That is what I get for putting in that extra effort all the time to avoid drafting. I did not even tried make use of the legal advantage of staying in 12 meter distance to the rider in front. But how should this referee know? >386< I still remember the referees number. A 5 minute penalty I will have to dismount at the next penalty tent. Worse I have been judged of unfair behaviour. What do I do with this? I am furious. 5 min! Me drafting?! I hit the pedals, speed up about 50 km/h. The pack I was fighting with did take over as the referee punished me. Now they are in front and the referee busy with everyone of them. But blocking my way. I yell as loud as I can at the referee as they block my way to overtake the pack. He draws aside. I rush forward. My legs are hammering down the pedals. 5 min! I have to go 5 min faster until the penalty tent to make it even, right? Climbing up to Sant Pol, there is an aidstation right on top of the peak. My family waiting and my kids waving. I did not expect them, as we agreed it would be too busy and too stressful for them to be there just to see me for a few seconds. But my daughters persisted. I had tears in my eyes and nearly cried of happiness. My throat felt corded up. Penalty tent was chaotic. 5 minutes I keep watching people I overtook before. A few minutes later I start again. Still furious. I will get every single one of you! And I did. I was not aware of how much energy I am wasting and on the last 20 km I paid for a some missed long endurance sessions in training, because of sickness, family matters or work commitment. 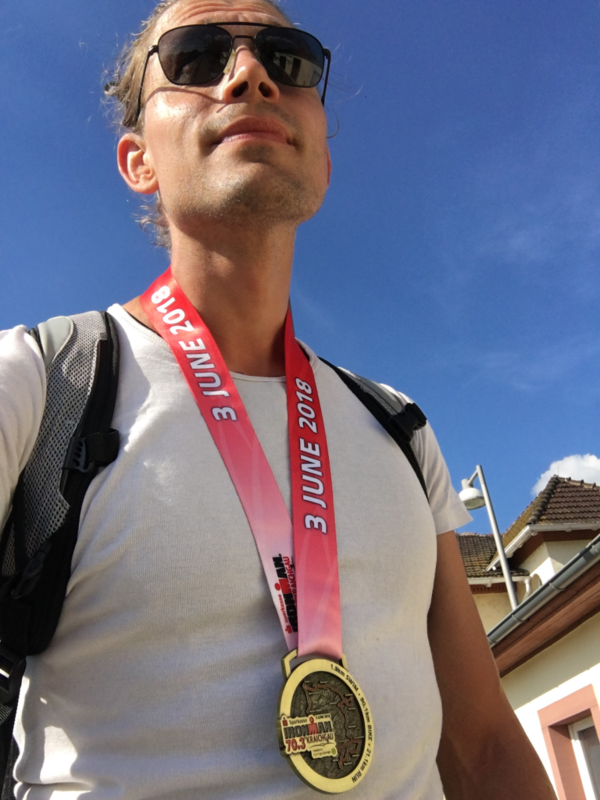 I did not expect it, but after 180 km I was kind of looking forward to get off the bike and run. 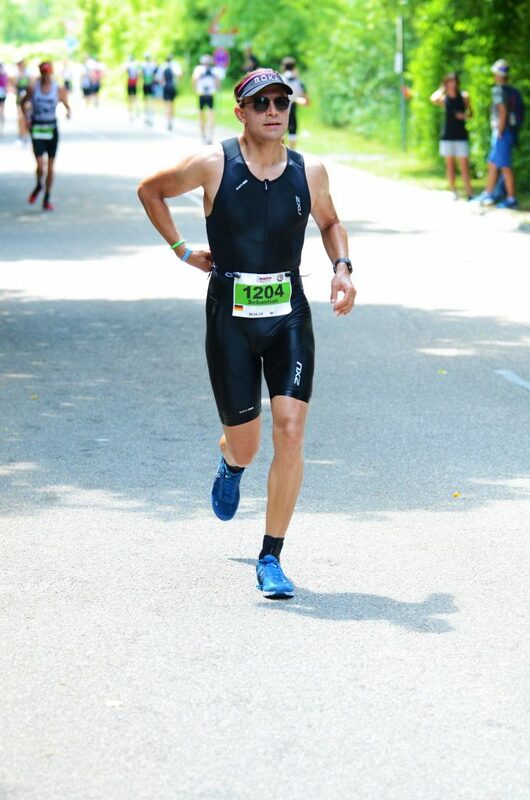 My third Triathlon race and I still do not jump on the bike but put on my shoes in transition. It does not look pretty, running to or off the bike but it looks by far worse falling off or over the bike when trying the “fyling mount”. Believe me I have seen it. Though it is a bad excuse. I should practice it more. Actually I can do it, but I am just not confident enough to do it in the race. If you do not know what I am talking about,here is a GCN video explaining the “Fyling Mount”. I run off the bike with cleats under my shoes. My first strides are a bit rocky but no cramps this time. 180 km bike leg done under 5 hours and my legs feel good, I am rushing into transition with smile on my face. I slip into my beloved ON Cloudflow running shoes, pull up the elastic laces, take off the helmet and carefully place it into its protective bag. I put on my race number, 1262, cap, take a sip of my water bottle, one flask of carbohydrate gel into each hand and off I run. Along the promenade at the beach towards the event area and later finish line, the sides are packed with spectators. Friends, wifes, husbands and kids cheering on the athletes. My pace is to high. I am struggling to slow myself down. I am feeling good and adrenaline is pumping through my venes. My feet move fast, too fast but I am not alone, that makes it even worse. About thirty minutes later the field stretches and the pace is dropped for good. 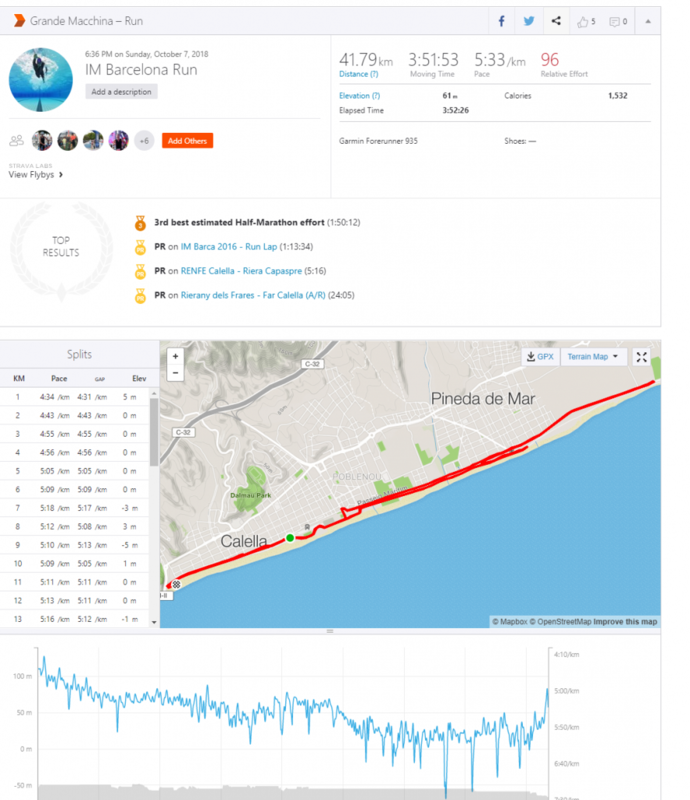 We run along Calella beach. The sun is out and there is little to no wind. Two more turns and we change from tarmac to sand, leaving the city behind. Railway tracks and the sea on one side and a few farmhouses in the middle of squarish farms with beautiful stone gates on the other. Not sure what they are growing here, it looks right out of some druglord movie and the smell at one of these farms plays right into the theme. My thoughts are drifting. Later I will refer to this place without shadow as the “desert”. Some Athletes are taking a leak behind bushes, standing in lanes in front of dixi toilet, or puking next to the track, some are walking or having a chat with each other. I am trying to calculate in my head at what pace I have to continue to make it to the finish line in under 10 hours. The thoughts get interrupted by a voice asking “Finish or try to finish under 10 hours and maybe…?” Start slow, keep an easy pace until the half marathon is done and then start to push. I started a bit late with the easy pace but it felt good. Contrary to the bike my right shoulder was burning in pain. Obviously by riding in aero position only on my right arm I must have put a lot of stress on the other shoulder. I know this “Pain Ping-Pong” well enough from my knees. The 150 gram gel flask in each hand, which I am lifting at a cadence of around 90, 45 times per arm in a minute does not make it better. One of them is just about empty and I get rid of it, only keeping the other in the left hand. Maybe I should have put them both in the back pocket of my suit in the first place. I pass the half marathon mark and it is time to accelerate, at least according to plan. I will push the pace right after the next turn. After about 7 hours of drinking 30-40 ml of carbohydrate gel every 20 min my stomach is giving up on me. I feel like I have to puke just by thinking to take another nip from my gel flask. Ditching my gel for now and start eating fresh oranges on the aid stations I am trying to cope with my upset stomach. I am not feeling great. I do not speed up and my mind just tells me “Keep going!”, “You like that!”, while I am struggling to keep the pace up. “Keep pushing!” I start counting my strides. Every time I pass by a music spot my pace goes up, I know there is still plenty in there. One more lap. Into the desert and back again! One more time! Having my kids in my arm when I return, that thought makes me homesick, as so often in long training hours. It is the most beautiful thing I can imagine. Tears wet my eyes. This thought carries me, Noa and Yva, they are carrying me through my last lap. I run around the last turn. “Lets get out of here!” Smiling again, still with wet eyes, I pick up the pace again, at least it feels like it, as I have stopped checking my watch for my pace. I enter the promenade and the final some hundreds meter I pass by some guys in my mind already celebrating. Shortly after the arch, my body relaxes, the core and tension collapses, I can stand but I do not mind the supporting hand guiding me towards the exit. It is a well timed procedure, catch the athlete, keep him on his legs, put a medal around his neck and push the athlete into the exit channel, where a questionable snapshot is taken before one is allowed to enter the athlete after race area/ tent, right along the Finisher T-Shirt stand to the medal engraving stand. He asks “M?” “Can I have two S if possible, for my daughters please? !” Without any arguing needed he prompted me with two S and an M for myself. You can not imagine the relieve. After picking up my engraved medal. I find my way towards the buffet, warm toast with melted cheese, something I would usually never eat but now I love it. Followed by some Catalonian sweets from the bakery, melon, orange, pineapple, nuts, coffee, oh my gauge, I am so hungry. Beer! “Boah!”I nearly puked by nipping at it. It started to rain right after I finished. Ten hours and seven minutes, I just missed the sub10h mark. Whatever, I think I did still okay. Athletes keep coming in, shivering not able to hold a cup, crying like children, some are sitting over their tea and cookies chatting as they have not done anything else that day. A big lane in front of the showers stops my considerations. 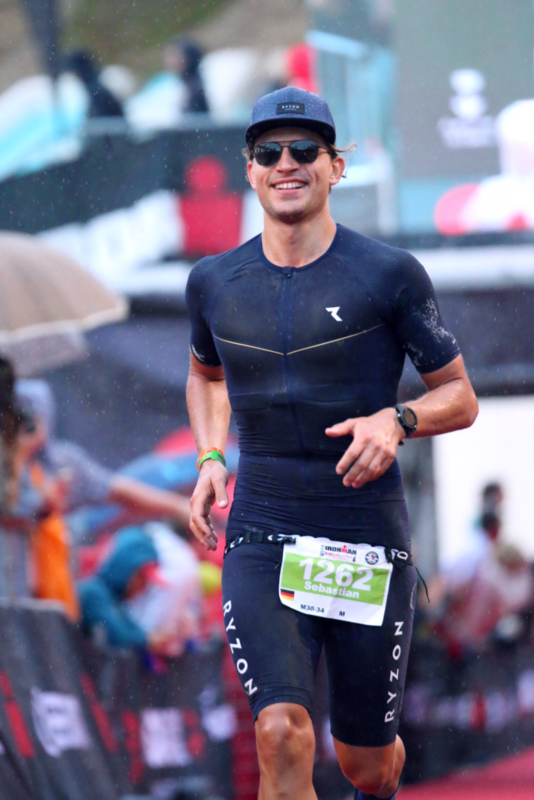 I pick up my white after race bag, pull out a fresh shirt and slip it over my racesuit. Walking through the massage recovery tent with about 40 tables setups, all occupied by athletes under warming goldfoil covers, I remember my massage after my last race in Kraichgau. It would be absolutely worth the wait. But I walk right through the tent, dismissing the chance of magic hands tenderly loosening my tense muscles. I only want to go home, embrace myself in the arms of my kids. 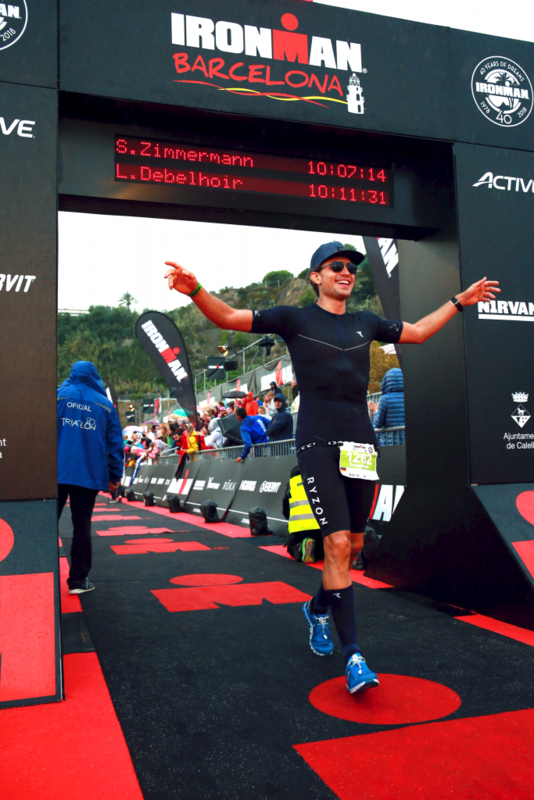 An Ironman race might seem like a daunting challenge, but the race is the reward for me as an athlete. The Journey is the challenge. Whatever I have achieved in my life so far, I only did with the direct or indirect help and selfless support of others, my friends and my family. I want to say Thank you! to my Coach Vladimir Savic! You are the Best! I want to say Thank you! to my family and especially to my wife and my two daughters Noa and Yva. Thank you to all my friends out there, close and far! I love you! I am very lucky to have every single one of you! Triathlon. About a year ago I set out to fulfill one more of my childhood dreams. I think to remember watching some live coverage on a 13″ small TV screen when I was a kid. The Middle Distance now was my second step towards this goal. 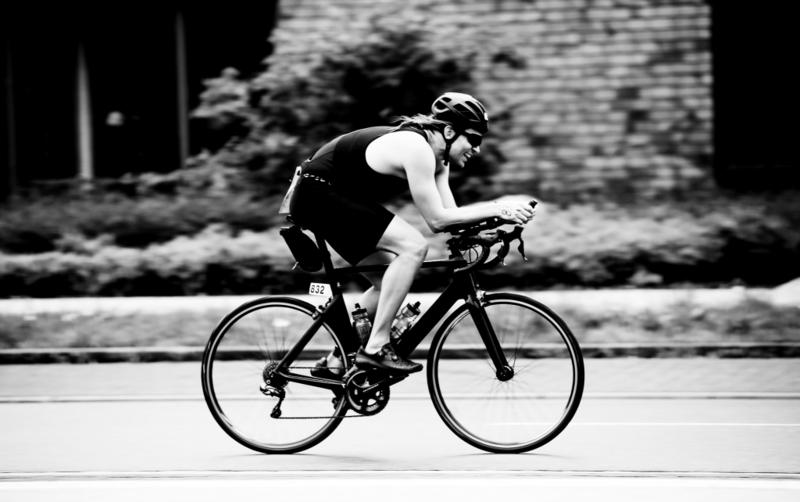 The Ironman 70.3, also called half Ironman, is about 1900 m Swim, followed by 90 km bike ride and completed after another 21,1 km run. 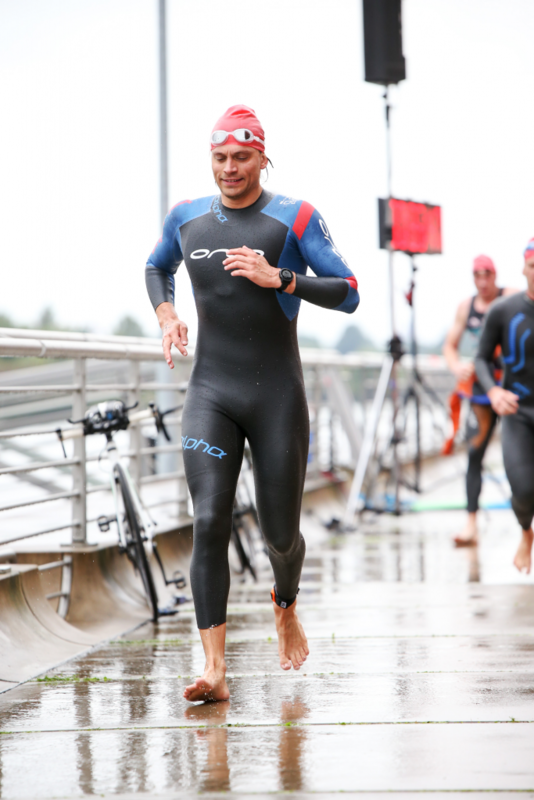 I did the Olympic Distance Triathlon last year, as a preparation, to get to know the whole procedure before attempting the middle distance Triathlon. This can not be much different, just a bit longer, can it? One day before the event I got up at 4 a.m. to catch my train. When I arrived at about 12:30 p.m. in Bad Schönborn I soon realized that this is quite a bit different. 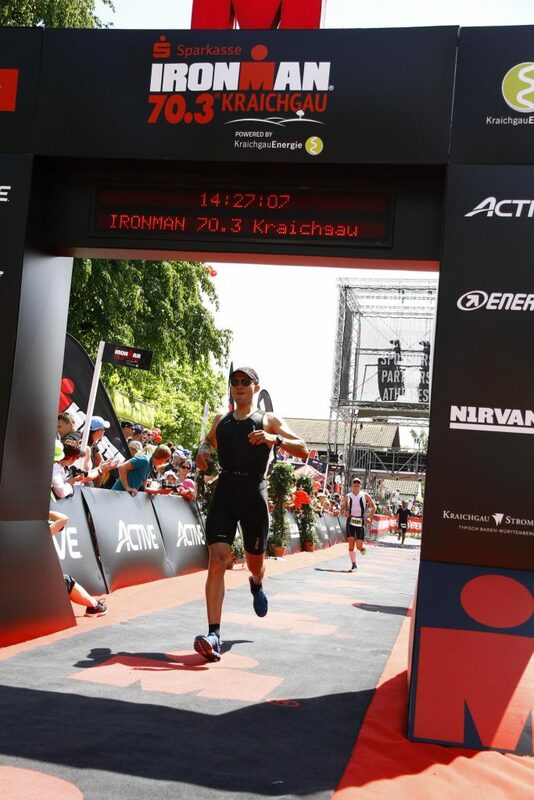 Ironman waypoints at every corner leading my way through the small lovely city of Bad Schönborn towards the event area. The sun shines hot and no activity is needed to bath in sweat. About 4000 Athletes, 2400 Agegroupers for the Ironman 70.3 with friends and family fill up the area, just giving a taste of what is to come. An hour of race briefing, is followed by a couple of lanes to wait in for hours to register my self and receive my transition bags and race numbers. “1204” is the number I receive. But the journey started 10 month ago. I believe with all my heart that anyone can do whatever (s)he wants just on his(her) own without supervision successfully only limited by his(her) power of will. But guidance might shortcut your way, save you form injuries and make the whole experience more enjoyable. 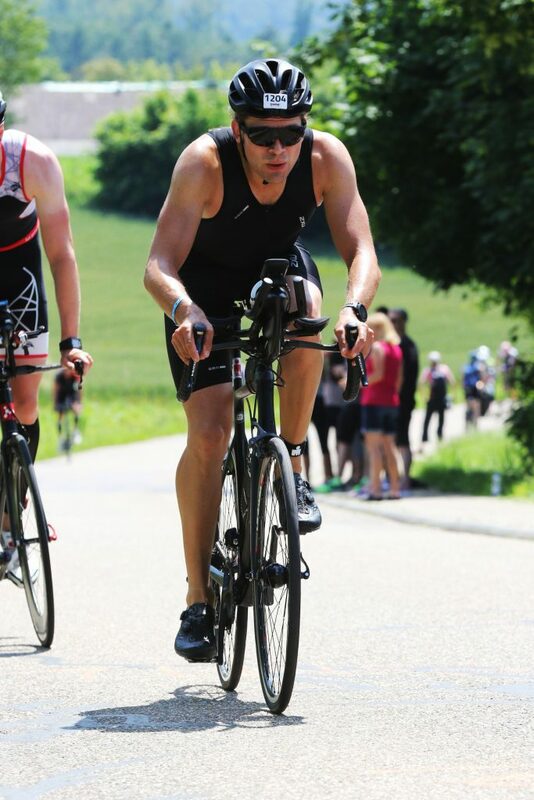 My professional Triathlon Coach Vladimir Savic gives me consistency, plans my session efficiently and deliberately builds up my swim, bike and run abilities. He gets the most out of my time and potential without compromising my health. With his availability he gives me security and with his knowledge he makes me fast as possible on my way to reach my goals. Do not get me wrong, he makes me suffer as I never would be able to do myself. I trust him with my health and consider him a friend. 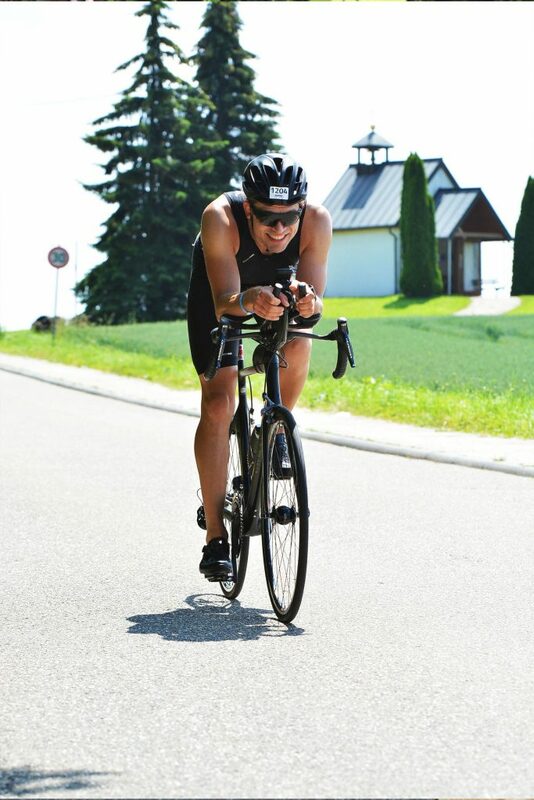 The 3 weeks training before my first Olympic Triathlon in Bremen last year, have been just a warm up. I love to tell I was a semi professional swimmer in my youth. But this is much exaggerated, as I stopped when I was about 11 years old. I was mostly doing breaststroke only back then. 11 month ago getting back into swimming I was out of breath after a few lanes in freestyle. I had to relearn freestyle and I still have a lot of technique training and drill sessions ahead. My bike was okay but so far I was given the impression that I am not made to be a runner. My Training volume raised to an effective 8 to 12 hours a weeks, with a maximum of 16 hours in race preparation. While the training time remained consistent. my swim distance got longer. My usual swim workout raised to about 3000+m. I always loved water more than I fear it. Now I also love doing freestyle. I get into flow, my breathing relaxed and natural, as I would not even move the head sideways to breathe air. The surface tension and resistance of the water on the skin of my hands feels like pushing away a very soft pillow. I watch the light sparkle in the air bubbles rushing from my finger tips towards me. It is like dream you do not want to wake up from. I started to swim butterfly, another goal from my childhood just along the way. I remember the sessions when I first flied like yesterday. The moment when I broke the surface and everything seemed to happen in slow motion. The head followed by chest and arms break out of the water. The whole body is tense while my arms open wide like wings over the the calm surface of the water in front of me. Just a few drops of water flying ahead, leaving raindrop like rings on the surface. It felt like an eternity but it was a short moment to fill my lungs and pierce back into the water. Just to fulfill another wave like motion before breaking out again. I was eleven years old when I quit my swim training. Somewhere in Berlin in a big indoor pool with broken windows in the roof and a very yellowish light, I was swimming breaststroke on a 25 m lane. My friend Robert (Schwarz?) was on the lane next to me. Both of us have been selected from the team for individual training. At the end of the lane was my trainer yelling the time of my split, pointing out exactly how much my lane neighbour was faster and the other way around. Out of the water the cold grip of winter air blowing through the broken windows makes me shiver. I walk over broken floor tiles to the shower. We do not look at each other anymore. Not in the shower, not the locker room and never again. I felt like crying when I left the pool, maybe I did. I am riding my bike at any season, weather or daytime. But with the raised training volume I started to stick to the plan. Most of the last cycle my swim and run abilities have been in focus and the overall training volume of my bike much reduced. As efficient indoor training might be and since Lionel Sanders even fashionable, it was a relieve to get out again and I enjoyed my sessions a lot. Though something had changed. 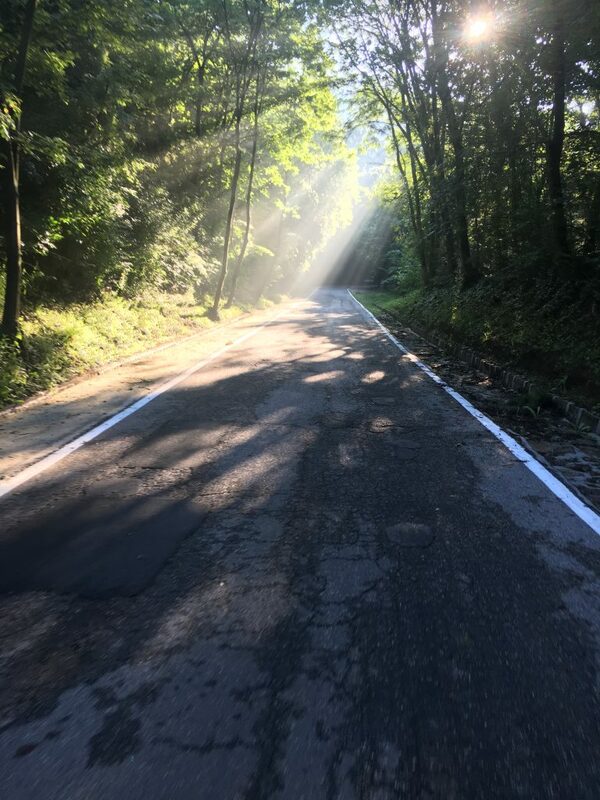 I remember killing hours on my bike in the Berlin Grunewald or around Belgrade in the very early morning without ever getting bored. Suddenly I feel a need for speed, or at least intensity. Most challenging sessions now are not when I have to leave my comfort zone, to make use of every fiber of muscle in my leg, overcome the pain to reach the right heart rate zone for this days training purpose. I am challenged by “LSD” sessions. Long slow distance, building base endurance. There are so many things on my mind I want and got to do, that being out there alone, just listening to my inner dialogue feels cruel at times. I think these have been the only sessions I cut short sometimes and not because of exhaustion. My run workouts are mostly about an hour and every month I seem to cover some more distance in that time. No other discipline showed such obvious progress. One of my best moments was when I realized that my feet have changed back from flat and over pronouncing to a neutral healthy shape again and my dynamic X-leg is straight as it can be when my feet hit the ground. I assume it happened in the last 3 years by walking in barefoot shoes and a healthy approach to raising my training volume slowly and a lot of core strengthening. I am not sure what it was exactly, I am not a doctor but the moment I got my first pair of neutral shoes, ON Cloudflow in my case, I made a big leap forward. My whole technique seems to have change, I got less to no problems and I swear I got at least some 10 seconds faster in average on 1 km. Maybe it is psychosomatic, ON has quite some good marketing, but so be it. I love to fly ON clouds. There was way more on my mind and schedule while training for an Ironman but training. There is core training to stay away from injuries and imbalance. Body composition or just proper daily nutrition was one of the hardest parts for me, especially because I love to cook and bake and chocolate. Then there is technique knowledge, mental training, equipment and general coordination and organization. But before I get lost lets talk about “Raceday”! It is a beautiful sunny morning. Bright saturated green covers the hills along the roads towards Ubstadt-Weiher. I am sitting in the car of my friend, starring out of the window. While I tried to visualize what lies ahead of me, I did not realize that I will hammer down the very same road a few hours later. I drop my white after race bag on a loading rack of a truck. The event area is packed. I enter the transition area to load my bike with gels, hydration and my Garmin device. Hundreds of bikes around me, and as many athletes. Everyone was laughing and joking around the day before. The mood has changed. There is tension and anxiety written in the faces of the athletes. Their expression serious and their eyes look mean while they focus on their minds. I check the place of my blue transition bag before I leave to get to the beautiful turquoise Hardtsee. I am nervous. There elbows and shoulders, everyone seems to be somewhere else. But some are carrying a smile. I try to get in my wetsuit, it feels much more difficult then ever before. Somehow I lost quite some time walking around this mesmerizing atmosphere. Suddenly I have to hurry up as they start counting down the time for the warm up. I manage to jump into the water and do just a few strokes, before I have to leave it again to enter the rolling swim start area. There are lanes according to your own time estimate for your swim, somewhere behind a wall of hundreds of athletes in black neoprene suits. We are lucky just one hour later it would have been to warm and the wetsuits forbidden. But there is no way I get further to the front. Man and women standing shoulder to shoulder and chest to back. A shiver runs down my spine as the sudden stunning sound of the canon explosion announces the start. My hair would stand up if it would not be shaved off or pressed down by the super skin tight neoprene suit. Every five seconds four athletes at a time enter the water. There are at least around 500 people in front of me. But we can watch the pro field thundering through the Hardtsee. My lungs contracted, exhaling all air, leaving me unable to breath in again. I remember this early morning in the already hot Serbian sun in Belgrade. I got a panic attack in training in 1,5 m deep water when the white pebble ground was broken up by dark algae spots in the clear water of Sava Lake for no comprehensible reason. It must be some kind of deep water phobia. I step into starting position. A race coordinator places his hand gently in front of my chest. His hand goes down and he gives the way free. My feet drill deep into the dry sand of the beach. It is happening now. Every fiber of muscle tenses and the whole body seems to explode. I rush into the lake and fling my self into the dark turquois water. With one wave like motion I accelerate right under the surface before my arm break out again. For some reason there is no sign of anxiety left. My arms propel my body forward in an even rhythm. There is no doubt of direction. My breathing aligned with my stroke. I am in flow. Just seconds in the water, I overtake the other three who entered the water with me. And another one, and another one and it did not stop. I started to smile and a deep feeling of happiness and joy gave me butterflies. 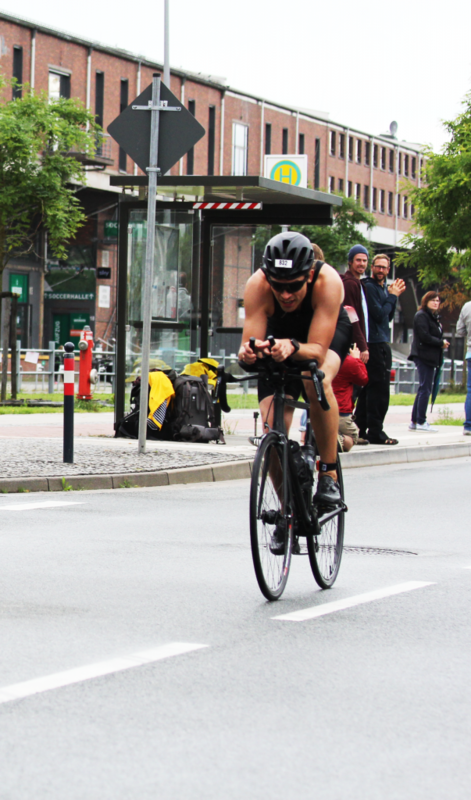 Remembering my bike ride in Bremen, I would have never expected a swim to be like that. I could hardly see the buoys to figure out the direction I had to swim, but I could follow the feet and air bubbles of the others. It was exhausting to swim around all these people, some where even trying to grab my legs. But overtaking one by one gave me a lot of drive to push on. Suddenly I see the ground, the swim is over. After roughly 2000 m and 31:04 minutes I am running out of the water. I never felt that heavy in a brick training, but I also never felt so happy about my swim. 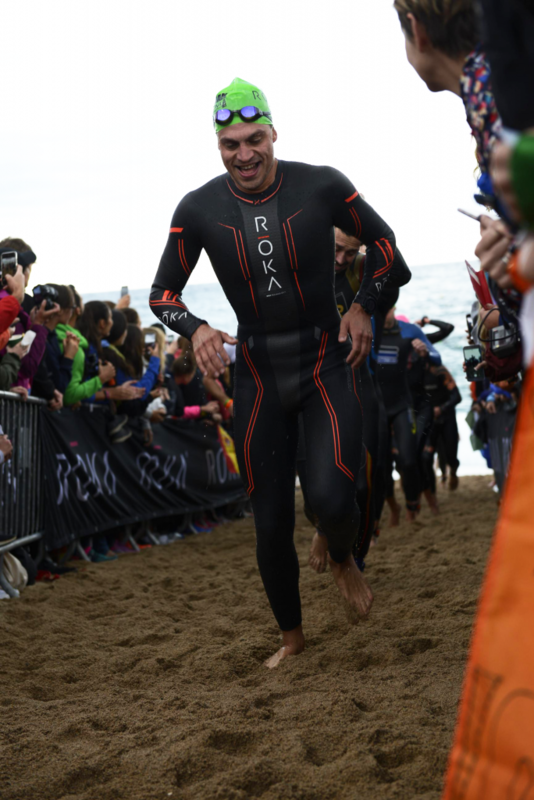 With a slightly drunk feeling and unable to open my Roka wetsuit. I make my way back to transition on wobbly legs. I think I hardly used them at all in the swim but my legs are just before cramping and I have difficulties getting out of the suit. A few moments later I grab my bike and run to the mounting line. I feel the beat of my heart, full of anticipation. My foot presses down the pedal. This is my discipline. One deep breath fills up my lungs. The land of the thousand hills is ahead of me. 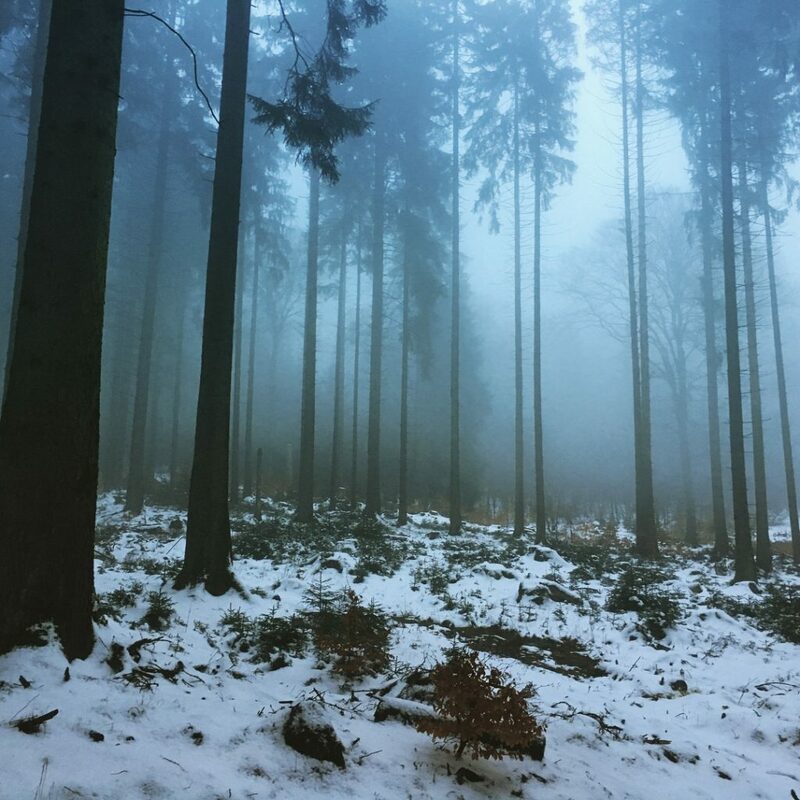 Will I handle the climbs I never practiced for in the north of Germany? It is pretty hot. I rehydrate by emptying my front tank through a straw in aero position right away. I check my heartbeat. 172. I have 4 heart rate zones defined by my coach to pace me well in the 90 km bike ride, to still have enough in my legs for the half marathon ahead. 4 Zones with a maximum heart rate of 165 for short steep climbs. Attributing my high heart rate to my swim effort, I disregard the numbers for the moment. Two minutes in to the ride I hit 44 km/h and my heart starts to calm down. I am overtaking the first few riders. Slowly, one by one but in a steady rhythm. I consider to slow down. “Should versus could” echos in my head. But I feel good. I press on. Not even 10 km in the ride an athlete rages at the side of the road. He is about to explode, hurling his disk wheel with a loosened tire. I feel sorry. May that never be my destiny. The field is still quite dense. The judges following us on motorcycles. I am trying hard to stay out of the 12 m wind shadow boxes of the other rides. More then once I accelerate to take over a whole group just to get them out of my way. There it is. Some 30 minutes into the ride we hit the first accent first gradually then we approach the first proper ramp. I go down in my gears keeping my cadence up and press on. Overtaking one by one on the climb. Maybe I am pushing to hard, will I miss that power later on to keep going? I keep going up the hill, happiness all over my face like someone has given me an unexpected gift. I reach the top, push my gears up and hit my pedal with full power to accelerate again. Seconds later I hit 67 km/h, I am still comparably heavy with my racing weight of 84 kilo. I keep overtaking people. There are a few like “Tommy”, I do not remember his racing number, a really tall super skinny guy looking like a Cheetah in his aero position, who keep coming back for a while but most of them I never see again. I had a heart rate baseline defined for the flat. 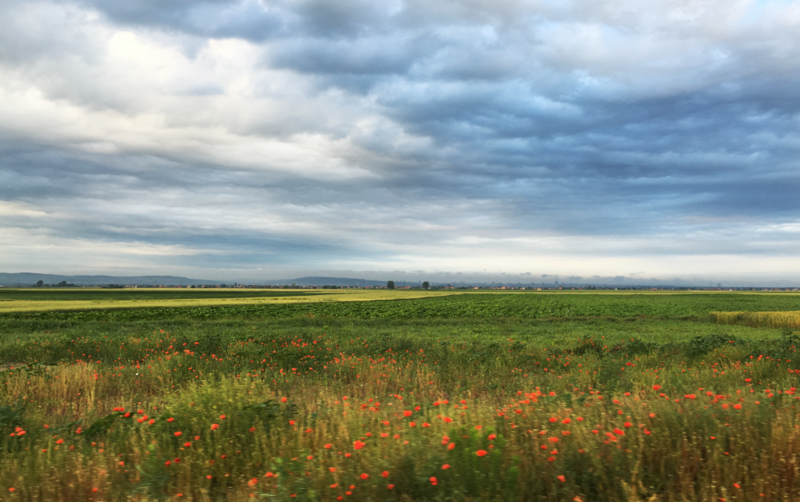 In Kraichgau there is no flat. Either you climb or go down like rocket. I eat gels and rehydrate on a predetermined pattern like a clockwork. I empty my last bottle just before the aid station, throw it right in to the bin to pick up some water on the fly as planned. 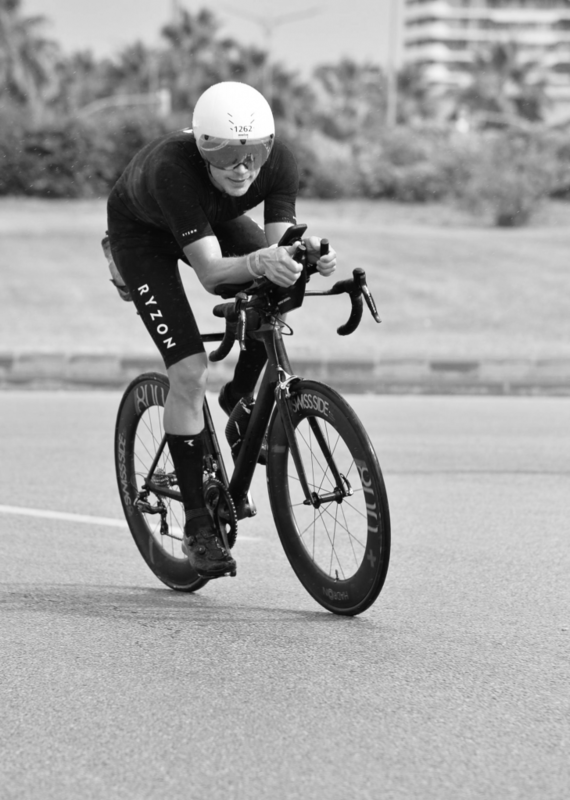 The new bottle finds the cage behind my back and I get out of my saddle to accelerate up a steep ramp in a little town, overtaking another 2 competitors. Going down fast into a curve, I hit some bump in the road which slingshots the just picked up bottle out of the cage. Shock! After a glimpse back, I breath out in a relief, as no other rider is in danger to crash due to my bottle and see a volunteer already on his way to pick it up. Nobody can hear the “Thank you!” going over my lips. I push on and check my front tank and race bottle in the triangle of my bike for any remaining hydration. I am out of water. After some more climbs and descents I am alone. The first time in the race I can not see the next rider to take over ahead of me. I am rushing down a hill but closing in to the next ascent vanishing in the forest in front of me I spare my legs. Still thirsty. Suddenly, like a rolling thunder, his helmet flashed bright up in the sun when he flew down out of the forest like a hawk. 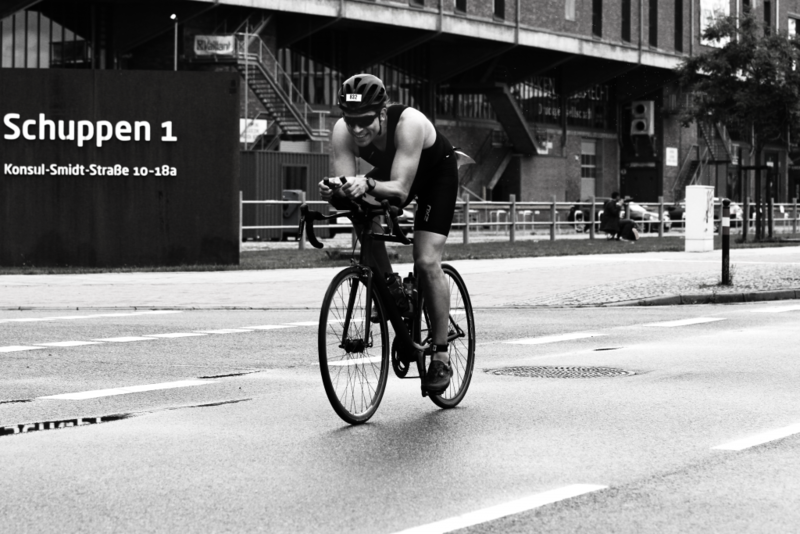 Ducked deep into his aero position, Jan Frodeno already on his way back, passes by with a roaring sound. I think I stopped pedaling for a moment in awe. A few moments and another climb later I descent with over 70 km/h wondering about the top speed of Jan. Hell he was damn fast. At the aid station, I pick up some water. Hardly enough and in the next climb my legs start to cramp. Did I lit to many matches? I concentrate on my breathing, my gears low and my cadence steady. I try to go out of my saddle, no way, my legs force me to sit down right away. A pack of riders overtakes me. I saw these guys checking in yesterday. They did sound Swedish or Norwegian to me. In their twenties I assumed, really good looking like fashion models with the best bikes and gear available. My legs hurt. Every stroke hurts. I am not feeling good but I keep going. Another rider with a broken bike at the side of the road cheering his struggling comrades. I reach the top. No rest but time to chase them down. Before the last big climb I got them all packed in again. Looking down on my Garmin I feel deeply sad. Disappointed. Nearly 1000 m of elevation and over 80 km distance on my display. That’s it? In regret I realize that I am just about to finish the bike leg but there is a half marathon waiting. After 2:36:17, 90 km and 1000 m of elevation I click out of my shoes and run barefoot towards the volunteers to leave them with my Canyon Aeroad and head into transition. I am changing my gear in a relaxed manner. The guy next to me pulls out a flask of his transition bag before he runs off. I am jealous. Hopefully there is some aid station right after the tent. Some volunteer kids are handing out wet sponges but no water here. I swallow another gel. I am thirsty but my legs are good. It is hot. Six minutes in the run my lace opens. I stop, nearly laughing out loud while I close them again. This never happened before with these shoes in training, not in the last 300 km of running. Amused I pick up my pace again. The aid stations are packed with volunteer kids. I take my time to thank them. They are standing in the heat all day long cheering and helping the athletes. I hope they do shifts. I take a shower, then two cups of water and 2 sponges soaked in cold water at every aid station, once a banana, once a gel, once an isotonic drink to spill it out right away as it tasted disgusting. My shoes were filling up with water from the showers so I started to avoid them. My legs hurt, my feet hurt, my knees, my hip everything seems to be busy inventing symptoms to make me stop. I keep running, constantly overtaking other runners. Constantly being overtaking by others. The field is really mixed up with paces as we are going 3 rounds between Bad Mingolsheim and Bad Langenbrücken. I think to keep my pace steady, but the analytics later reveal that the curve of my run looks more like a roller coaster due to the hills in the run. But my effort was. 1 hour and 41 minutes after one last effort to psuh my pace towards the finish line I run down the carpet and finish my half marathon. A few seconds later, not even out of breath someone puts the medal around my neck. 4 hours 57 minutes 54 seconds placing 60th in my age group. I cross the finish line, happy.
! Small addition, I found a nic recap video by “Sportspinner” on Youtube. It focuses mainly on the pro field but gives a great impression of the mood. Thank you @Sportspinner. I have learned a lot in the race. One of my biggest mistakes was my salt management probably. The guys at Pushing Limits just made a good podcast about it. I would like to look into a swet test and to try Precision hydration. 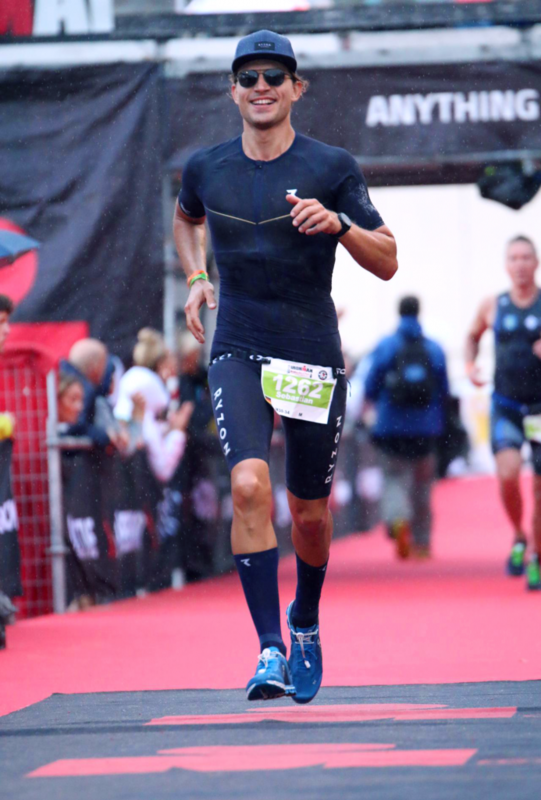 When I run, I keep visualizing Patrick Lange in Kona in 2017, so I will work on my technique and maybe check in for some Seminar with “Running wolf”. I am dreaming of switching some of my equipment going more aero with a Oakley Aro 7, some Hadron deep wheel LRS by Swissside, the Myth suit by Ryzon and some TX322 kicks from Lake. But I would need to find some sponsors to make this happen. For now I keep pushing while I have to give some love and time back to my family and kids who are enduring my dreams. Without them I would not be possible. My next Race will be the full Ironman in Barcelona in 17 weeks at the 7th of October just before my 33 birthday. “I would like see Papa to be the first at the finish line, I want him to win a race!”. Thank you Christian Van Asten for your LAKE cycling shoes! 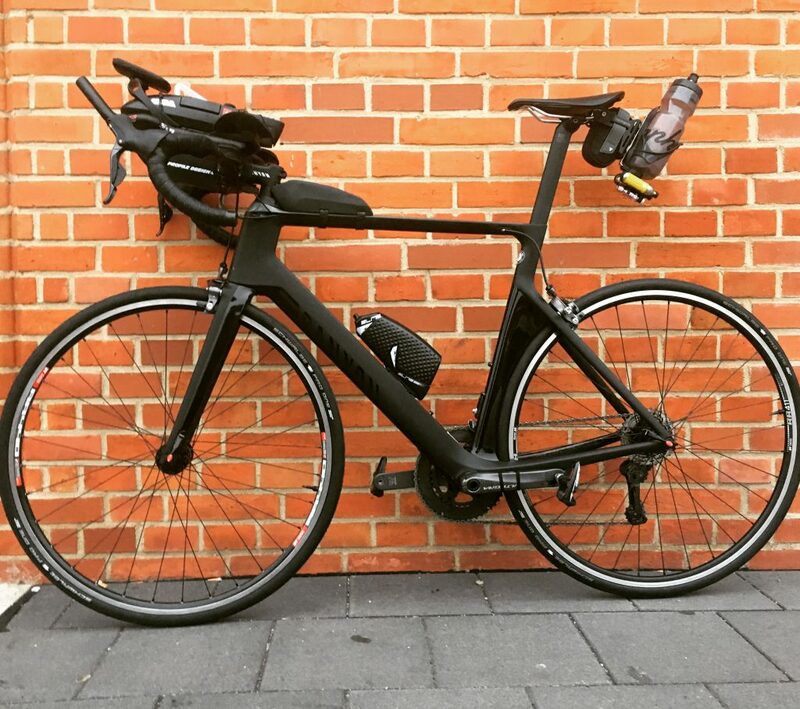 Since the “CX 402 Wide” cycling shoes just propelled me through my first Triathlon and have granted me a year on the road without anymore pain in feet, knees and hips, I want to share my experience with all fellow cyclists. There are many causes to knee, hip and lower back pain. The not right fitting pair of cycling shoes might be one of them. I find it hard to believe that so many top brands care so little about producing healthy and comfortable cycling shoes. 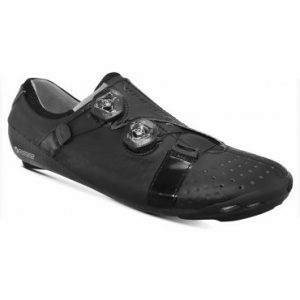 I have started out with click-in shoes, with the “Giro Empire”. 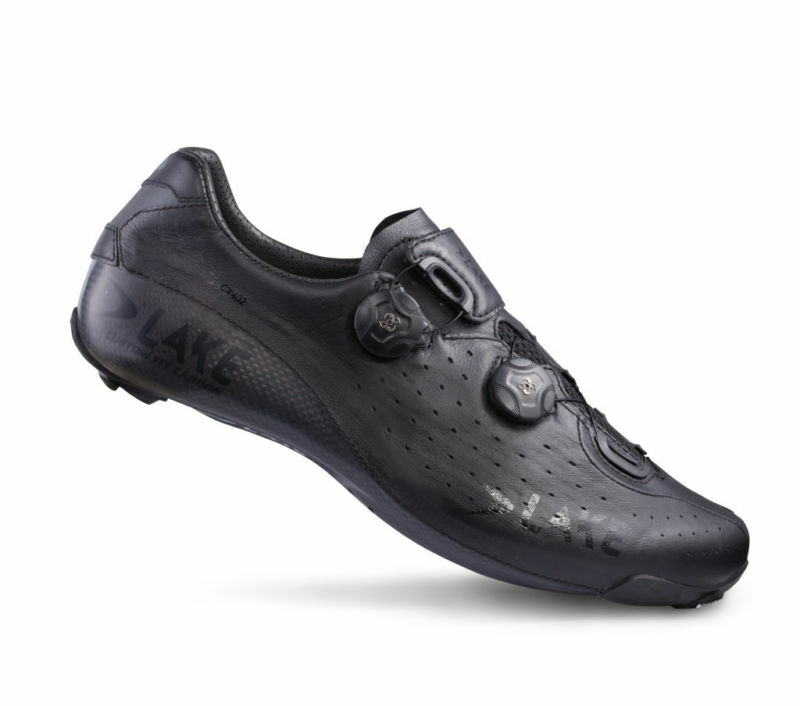 With no doubt it is a good looking cycling shoe. They felt a bit too tight to me, but I was told they fit just fine and I will get used to it. I got numb toes in autumn. Probably it was too cold for my feet. I cycled the whole winter with thick overshoes and numb toes. In summer I thought my feet expanded because of the warmth, when I had numb toes. 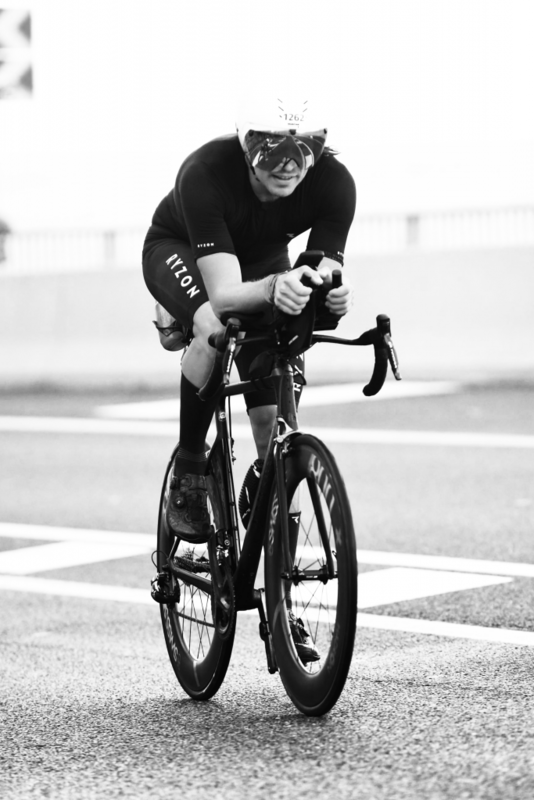 In endurance sport there is some pain involved, when we redefine our capabilities. But when we just get on the bike and ride, there should not be any pain anywhere. Get the right fit, get proper kicks and work your core! Knee, hip and lower back pain followed. Unbearable. Since I was training for the Transcontinental Race IV in 2016, I had to find a solution. Instead of sitting in the saddle, I started to spent a huge amount of time with doctors. Searching for the cause of pain. I have got a sport physio specialist “orthophysio” in Berlin analyze my muscles strength, balance and posture. They educated me in core muscle training. I received a professional bike fit by Thomas Pollesche from BikeAcademy Berlin including custom Solestar carbon Insoles. Before I learned about Lake Cycling Shoes, I tried different kicks from the major brands. I squeezed my feet in to the S-Works 6 in a Specialized store in Berlin. They told me it would be just the right size for me, even though the shoe felt really uncomfortable before even getting on the bike. They have been slightly upset, as I did not want to buy their top pair of shoes. in several sizes at home. 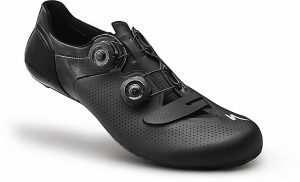 All models have been uncomfortable enough that I could not imagine my feet would feel any better when I actually use these shoes on the bike. There might be beautiful narrow shaped Italian feet fitting into those kicks or some feet less demanding, but mine are certainly not. I was nervous when I unpacked my last hope of cycling shoes. My heart rate went up when I put my new pair of Lake Cycling shoes in to the oven. Yes into the oven. You bake them to achieve a unmatched perfect custom fit. Even I like cooking and baking a lot, I have never been so adrenaline pumped when watching something in the oven. I repeated the process a few times. I warmed up the shoes, put the insole in followed by my feet and massaged the carbon layers on to the shape of your feet. When I slip into them they make a sound of a hollow piece of wood. 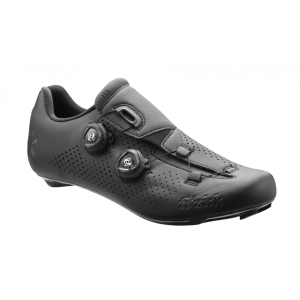 They are stiff and while I fitted them on my feet the first time, I could hardly imagine that a cycling shoe making such sound and with such stiffness could be comfortable. As soon I had them on, I forgot that I am actually wearing some cycling shoes. Not even my barefoot shoes match this feeling. They fit so well, I do not even need to close the Boa’s to ride. Does they make you cycling faster? I have no numbers to tell you how much faster I got by them, but I know how much longer I can ride because of them. 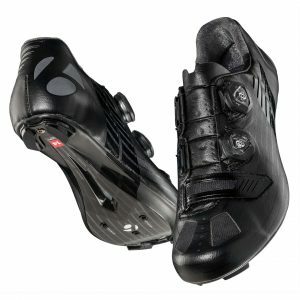 No more numbness, no more pain, no more limited by my cycling shoes. More training, more joy, I am definitely faster now. I have now cycled with the “CX402 wide” about one year and 10.000 km on tarmac in Germany, Belgium, France and Serbia. 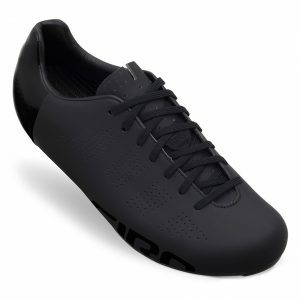 The cycling shoes are super durable, they still look like new. I love these shoes! You might argue about the pricing of the shoes, but then again it is hard to put a price tag on health and considering the value of lifetime not sitting at the doctor, I will not. The “CX402” are well ventilated and they do not claim to be waterproof. I had tried many overshoes in the winter before, but there was no pair keeping my feet dry and warm when riding over long periods of rain. After enjoying the “CX 402” so much I invested in the Lake CX 145. An wise investment, and cheaper compared to the number of overshoes I have ripped or which just did not perform accordingly. I did ride the whole Winter in them in every kind of weather, in snowstorm at minus 20° C and pouring down rain. 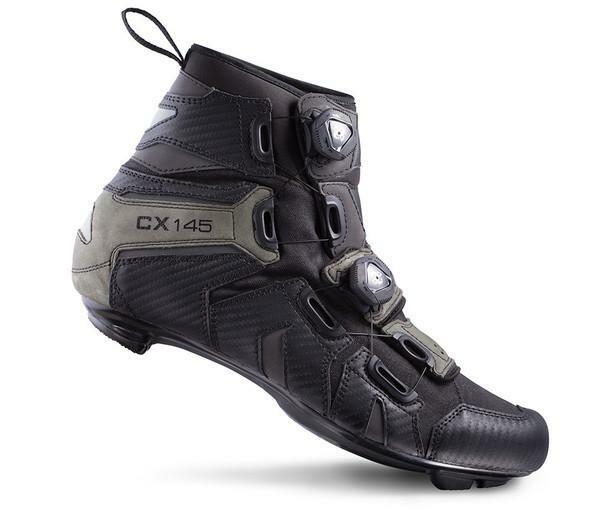 Of course the CX 145 are a bit heavier than the CX 402 but they are evenly comfortable cycling shoes to ride with. I do not want to miss them anymore. I might have failed at the Transcontinental Race IV, but I did not fail the health of my feet. With the CX 402 w and CX 145 w cycling shoes I found my perfect fit. I will never cycle with another shoe brand and the next shoe I will buy will be the “TX 312 Wide” for Triathlon. 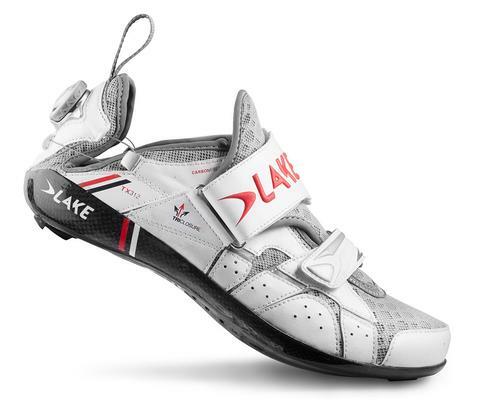 If you want to say Thank you to your feet, gift them a pair of Lake cycling shoes. Triathlon. A “first time” again. Again I am starting to fulfill one of my childhood dreams. These are the first steps on a path ahead. 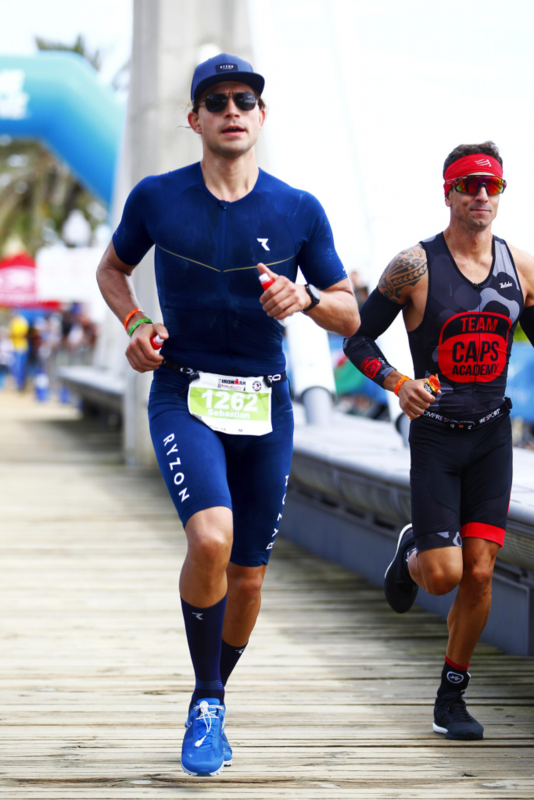 It was to experience the procedure of a Triathlon event, to be part of the triathlon community, to know what I am getting into before laying out a road map to achieve a goal I set myself as a child. Olympic distance was my choice to compete in for now. This means to perform a 1500m swim, followed by a 40km bike ride and finished after a 10 km run. It was to have fun and enjoy a race, hopefully finish it and to grow just a little bit. I was hardly thinking about what time I would finish. Surly I did the math based on my numbers from my training. But I disregarded these thoughts as pure nonsense, as the sum of the single efforts can not reflect the much more demanding challenge performing a swim, a bike ride and a run after each other. The sky was covered in clouds. There was little to no wind to hope to clean up the sky. When I entered the Transition Area to setup my spot, 832 my number, it started to rain. Nervous and excited I arrived, a little piece of paper on a metal bar, 832, to hook my bike on. It rains a lot in northern Germany, but for some reasons I got lucky since I moved here and never got surprised by bad weather in my bike training. Commute yes, wet to the bones but not in training. Today at my first Triathlon event water runs down my face before the swim and it is cold. I step away from the crowd who is busy preparing for a fast transition, putting anti chafing cream to all thinkable spots or already squeezing into their wetsuits. I am not even trying to hide how I check their transition zone setups. Until I realize that I am running out of time to get dressed up too. 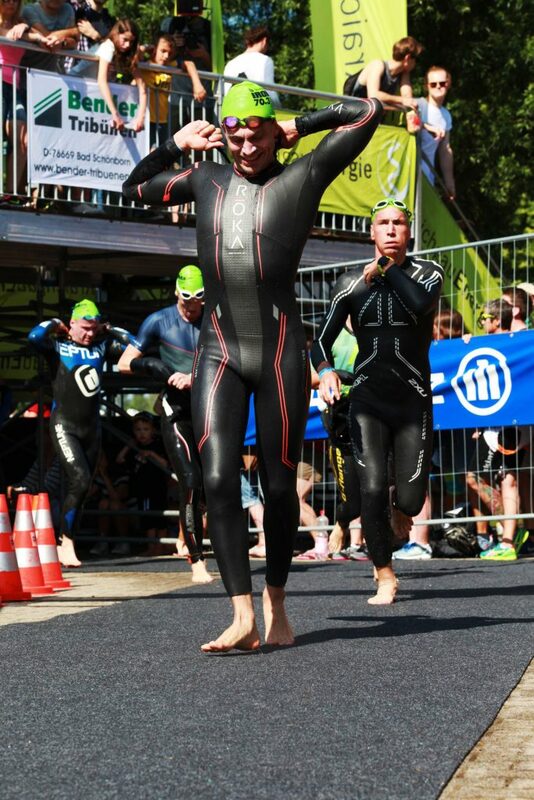 I jump into my wetsuit, it is a 5 to 10 min long jump, far from elegant and make my last preparations. We walk down to the harbor. We joke about the weather, I check the course around the buoys and jump into the water. It is freezing cold, despite the wetsuit. I flood the wetsuit and it gets worse. The water is greenish dark, I can hardly see a meter ahead. Did I mention I get panic in deep dark water? The commentator keeps bubbling his nonsense, nobody listens. Until he says that we would have to do 3 times the course, he corrects himself a little later that we have to do it “only” two times. Suddenly he counts down and a moment later the water explodes. 200 arms hit the surface at once. Noise and no time to think about darkness anymore if I do not want to drown under the bodies of athletes rushing through the water. The field stretches after a little while and as long we are not swimming around the corner at the buoy everyone has enough space and swimmers are no more stacked above each other. All in all it was pretty respectful behavior but it does not make it easier to find and keep your rhythm. Nor did the cold, the dark grey sky or the rain helped me with the orientation. A hundred meter before getting out of the water my hamstrings cramp. I swim on my back to take a deep breath, turn around again and let my arms do the work alone. After roughly 1700 m swim (instead of 1500) I take a few minutes to let the DLRG Life Guard stretch my leg. I get up and run with some pain to my bike, with a smile. I am happy. After I have left my spot in the transition zone well organized and clean, I mount my bike. Five minutes into the ride I find my legs. Now! It is race time! No that was not the plan. No, no racing! ….but. Hitting the pedals, a even whirring sound appears as I accelerate. I start to take over other riders. I am close to a 40 km/h average, controlled, taking my time to slow down for tracks and corners, the road surface is still wet. Four times the same track, at least it is not boringly straight and the rain did stop. There only a few people around the track, but it feels good to see them watching the race. Beside two beasts of riders who passed by, I am the one who is taking over and it feels good. I could have continued that for quite a while. I switched my shoes, even got socks on now and get on the track. 10 km ahead my vastus medialis on both legs feels like iron balls. It really hurts. I had eaten well on the bike and now put in Mg for the second time. Running a low pace and breathing deep and calmly. Smiling. 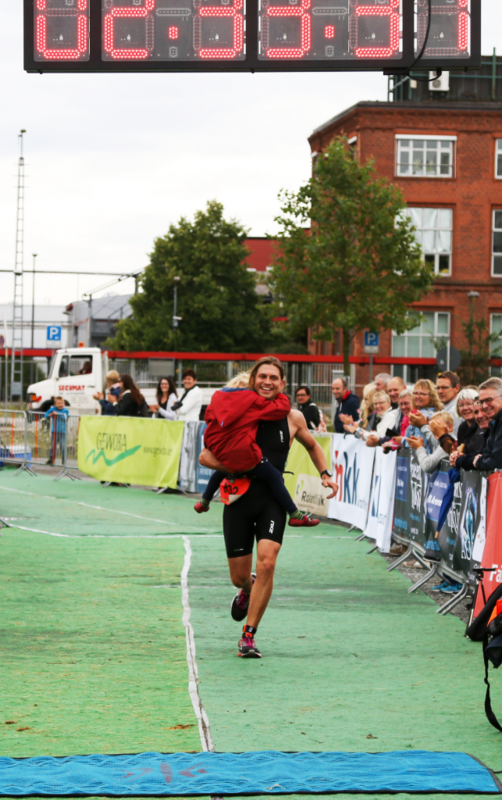 Another athlete passes by cheering me on “You are doing it, come on, GO! GO! GO!”. After 2 km in the run it is getting better. As long I am not trying to run too fast I can actually enjoy the scene. There is no more race. It is just me, I am running with. I am grateful for the people cheering me on and for every smile I earn. 2:33:32 – 54th overall and 12th in my age group not that it does matter. Back home I was still training with my 1970 Giant Road lite, fixed gear steel diva, while waiting for the horse I wanted to ride through Europe to arrive. The first few weeks while I was contemplating if I should buy a second hand road bike in Berlin or in Serbia or even another new one, I started to run. 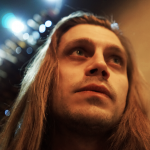 I wanted to keep my stamina up and my weight down, which has been a wise decision thinking of the Serbian cuisine being pretty meat and fat heavy and my general tendency to overeat. I had been good shape and my motivation was high up. I hit the road and did it all wrong. Today the December issue of the “Tour-Magazine” gave me a good laugh. An article for explaining cyclist how to properly run (for winter training) listed a bullet list the worst things to do and I did get a 5 out of 6. I think they have missed the point with running with too old used shoes. I started with 9 km a day and in the second week I already run 20 km and the week after I got it up to full marathon mileage per day. Not for long. My fitness was good, but running technique not existent and my shoes 8 years old and my joints and tendons had no clue what was happening to them. A “Giant” walnut sized ball in my left Achilles made me stop right away. It did hurt. 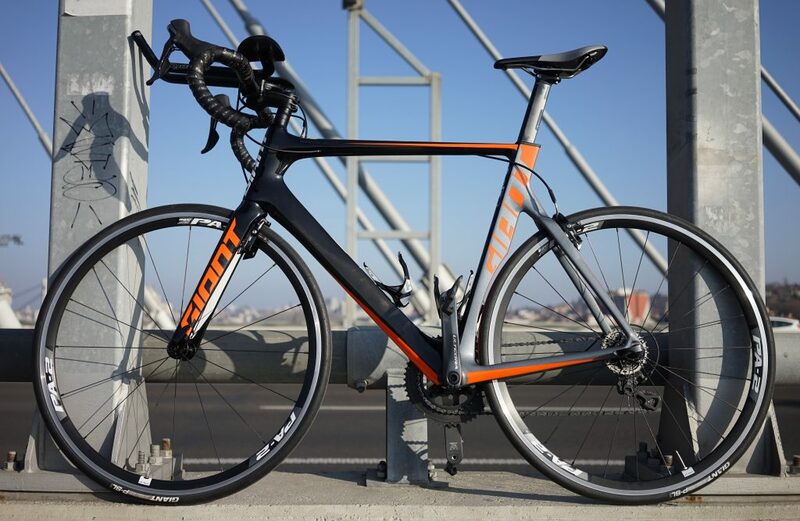 I decided to a buy a new Giant Propel Advanced. A beast made of Carbon, smoothly curved, lean in build, a thoroughbred of the road. Simply beautiful. It was still painful to walk and I could not yet rotate my feet properly. Stairs have been horrible but I could ride and I did. Tomorrow I will leave Belgrade (for now, my contract is over). This horse feels home here and I will give it to trusted hands to stay in Belgrade, someone who right now can hardly walk without pain, but hopefully soon be able to spin. Welcome another “Friend of the Road”! One day we may ride up to Avala together! 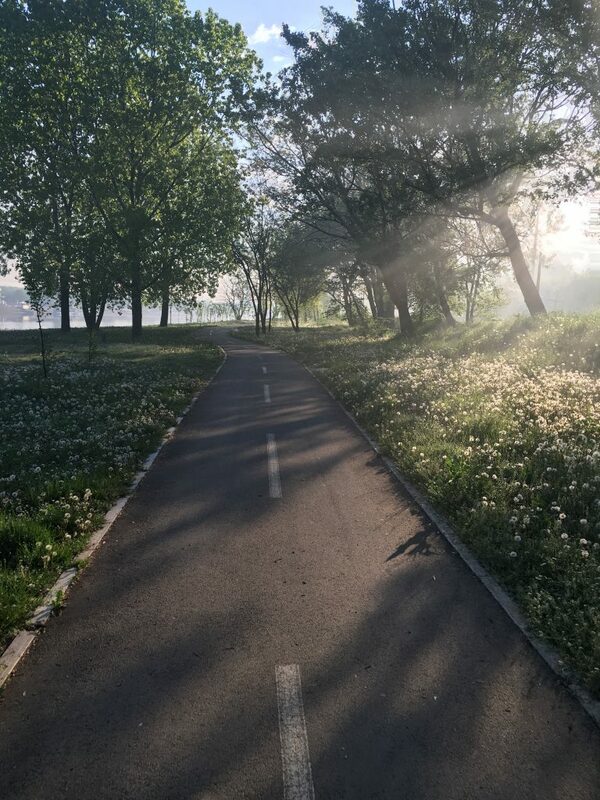 I am dedicating my first blog post to cycling in and around Belgrade. Around half a year ago I was given the opportunity to work for a company called “Nordeus“, with its headquarters located in Belgrade. Every week I have been onsite for three days. My way to work is now about about 1200 km, unfortunately not by bike. …was the first thing I looked up. Google results ranged from “…is not recommended…” and “In addition to reckless drivers, cyclists need to be aware of stray dogs…”, “…much of Belgrade isn’t cycling friendly…” to “we can’t say that Belgrade is very suitable for cyclists”. You may reckon that my observations are made from a different viewpoint. Above quoted statements might be true to the casual 5 km home to work city bike commuter. You get an idea of how the cities infrastructure is maintained from the first glance at the overall appearance of the architecture and condition of most vehicles e.g. cars. That does it not make Belgrade more suitable for road bikes. 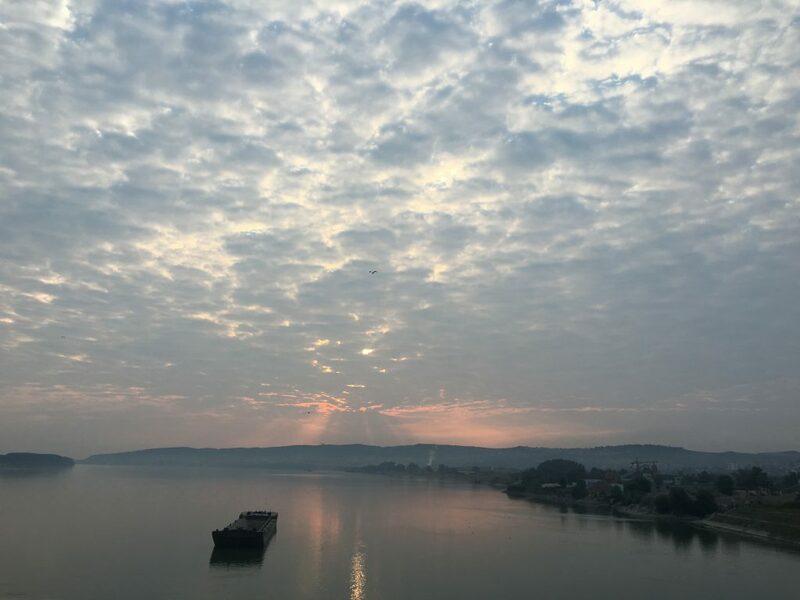 Though big parts of Belgrade, especially “New Belgrade” are relicts of 1950 socialist Yugoslavia and not much cared of since their construction, this does not make this city less adorable. 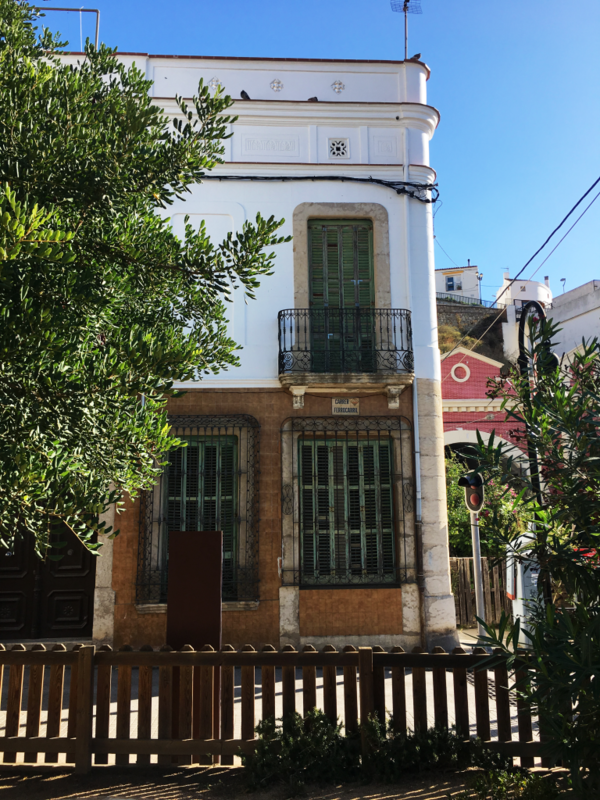 The Consistency of the Architecture has its own charm and there are beautiful corners and small road breaking it up again. 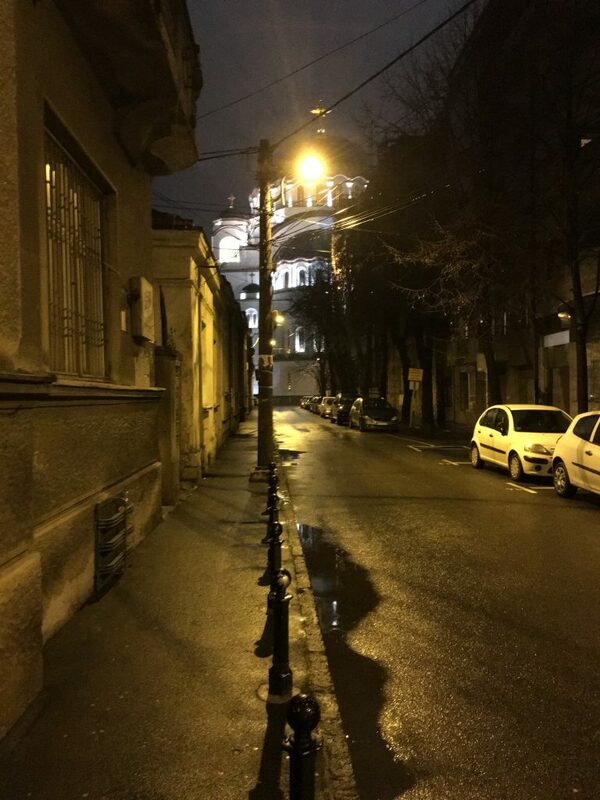 The “Belgrade Hills” make the cities landscape a great view, I enjoyed especially when lit up at night. Admittedly there seems to be a tendency for leaving potholes as is. They can be easily half a meter deep and can come in any size. All punctures I got in and around of Belgrade have been caused by tough bumps squeezing my tires between road and rim. Actually it has been three punctures in now 7 month. This is far less flats from bumps in Belgrade, then from cuts from broken glass of yesterday’s mindless drunk party folks in Berlin. The thread of punctures could be avoided by using tubeless tires. I can only recommend Schwalbe Pro One TL. I am riding these with my Berlin Rig now, and so far I did not have one flat! They are not only pretty flat proof, they also supposed to have a very low friction resistance and absorb a lot of vibration. For sure I can say that my 28″tires are super comfortable. You may ask, what help will they be when the pothole is 30 cm deep or when you get surprised by a “laying down police man” when you are descending with 50+ km/h. I am sure they would soften the impact after jumping over them. What is about the rims? Preferably you have hand build ones, I am sure my DTSwiss would handle this stress well. With my Giant factory rims, I went to my trusted Bike mechanic and had them tightened up. At Sportofis, recommended by a Belgradian friend of the Road, Marco did a very solid job for me. I had no problems since then. Cobblestones can be hardly judged in a negative way, don’t they remind us of the Legends racing Paris-Roubaix. Uphill they are great preparation for sprinting up to the the “Muur-Kapelmuur” in Geerardsbergen. I have not found anything challenging as these yet here in Belgrade…though close. If the roads are to challenging your bike handling is to weak. Are all over the place in Belgrade, but most of them focus on city biker and tourists. If you need someone to handle your road horse, pay Marco at near Sava lake at “Sportofis” a visit. A nice guy doing great work for much less as I am used to pay in Berlin for an average job. 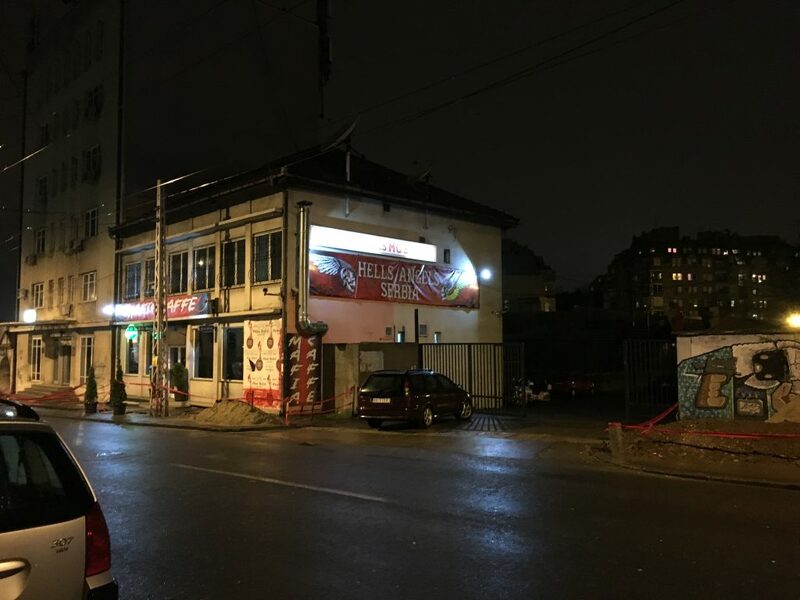 I heard there are a lot of good mechanics all over Belgrade, but I stick to the one I know. They are all correct with saying that the general level of awareness towards cycling on the road is pretty low. I am not sure if there is a law in Serbia as in Germany, that there has to be a minimum of 1.5 meters safety distance to the cyclist when taking over. Most driver will not leave such safety distance. This can be stressful when experiencing a pothole clustered road, especially uphill as its hard to jump over them when crawling up your 10%+ grade. Take the middle of the lane, most car drivers will avoid to overtake you on the road shoulder right of you. Now you have at least the space right of you to avoid potholes. I have rarely seen someone taking some extra distance, bus and truck drivers still doing the best job here, but I do not feel less safe on the road in Serbia then in Germany. In and around of Berlin I rarely have an 80 km ride without at least one encounter where someone is trying to demonstrate his believe “for whom the road is build for”, by taking over with a very low distance. A hand width to the handlebar, should make sure the cyclist understands what he is in for. Even worse behaviour is shown by “meatballs yelling out of their tin bins”. I have not experienced anything like this in Serbia so far. “Thank you!” for being tolerant and accepting to share the Road with all people. is a bit of a paradox. 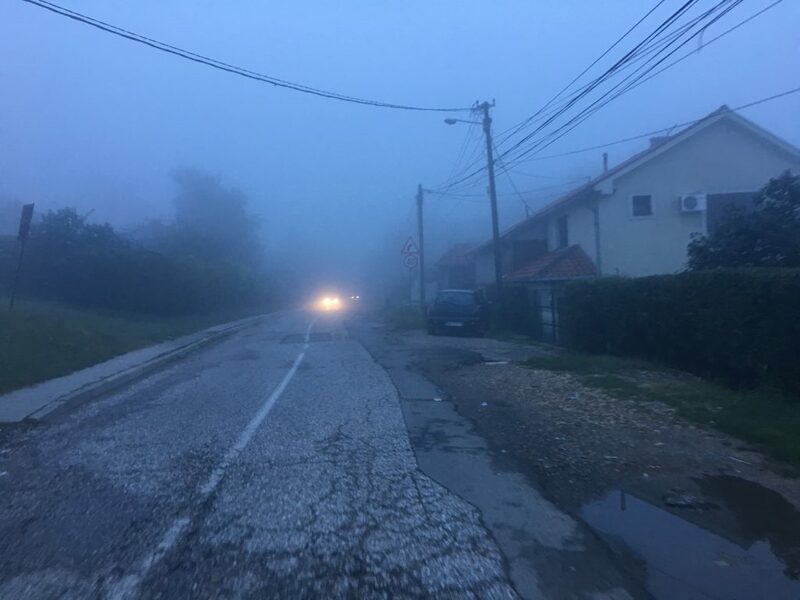 Air quality is hardly at the focus of Serbian government. I remember, being back home after one of my early beautiful and hot morning rides. Standing in front of the mirror and marveling my tin lines. Until the shower washed them off and the dark greyish water gave my tin lines to the bathtub, to the disgrace of my cleaning lady. You may consider to avoid rush-hour traffic. 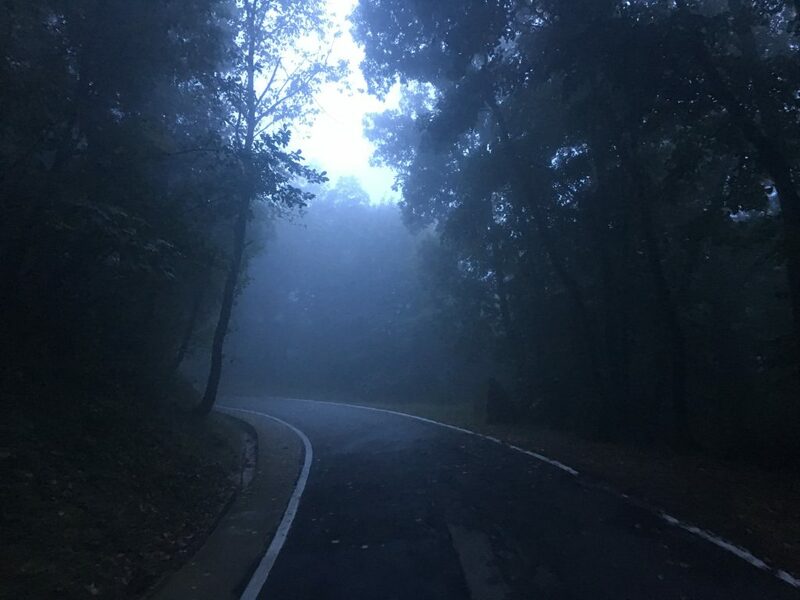 The way up to Avala is a relief to my lungs. I heard Cyclist will stay longer healthy when they age and have a longer life. I am not so sure about it anymore. Beside the rate of “road kills”, we do spent quite a bit longer inhaling the crap car drivers assume to be just and reasonable. If you are into Endurance Cycling, chances are you have read to some of the stories of the Transcontinental Race riders or the other big events and already know about these dog encounters with cyclists. In and around of Belgrade I did not have one 75+ km ride with not at least one encounter up to six. There are stray dogs everywhere, and there are a lot of dogs put in front of houses and private construction sides. Beware!, no, actually you will soon realize, that at least in and around Belgrade these dogs live along with the people walking around peacefully. But Cyclists, that is a different topic for them. They are starring at me while I approach, contemplating in their mind if you are worth to interact with. They may let you pass, they might come to completely different conclusion the very next day. There are some who will always hunt you, they suddenly come out of nowhere and are fully engaged. A friend of mine told me, the rotating pedal stroke drives them crazy, so I should just stop pedaling. So far I am not following his advice, and feel fortunate that all serious chasers been too short legged to outrun me. On the top of Avala, has been a pack of fours dogs most of the time I have been up there, and they ignored me peacefully at first. On day they suddenly came up to me, circling me, jumping up and down, while I kept balancing my bike on the spot until I found spot I dared to breakthrough. It was one of the most chilling moments I had with these guys, but I only felt their warm breath. Another time I have been heading back through Karaburma, it was early morning and rush hour. Luckily. Its hard to believe if you have not seen it yourself, but sometimes stray dogs attack passing by cars, jumping against it and trying to bite in it. This looks mental considering that they bounce off harsh, hardly avoid the following traffic and jump back up against the next vehicle. Karaburma main road has 2 lanes in both direction with a green line in the middle of them. There has been 6 dogs at the right side and another pack of 4 at the middle. Attacking cars from both sides, but when they saw me, it gave them an adrenaline rush. As it did me. I slowed down for a moment. When 2 cars with similar speed passed by, I rush forward in the middle of both lanes and right between them to pass the dogs. They tried hard to get to me, but turned around after aggressive horn usage of the car drivers. One of this moments I only wanted to go back home fast as possible. And one of these rarer moments I was very happy to share the road with cars. Evil dogs. I might be particular attractive to them, because they have not been my favorite animals even before cycling. But after cycling here for now 7 month, I fear them less and I think they are less dangerous then car drivers with a tendency for doing “self justice”. My latest memorable moment I was getting back up the Bulevar JNA. I did put my music back on after leaving Avala and now crawling up the hill on a beautiful morning. Some yelping sound, a tone not fitting the jazz I was listening so often already, reached me through my headphones from the back of my bike. I first ignored, but after it did no disappear, I turned around. A young half-breed whelp was trying to stick to my bike at 12 kmh and to catch my attention…heartbreaking. Short before Rakovica Selo I hope he found a new home there…and did not end up as so many road kills I have seen. Still feeling guilty. 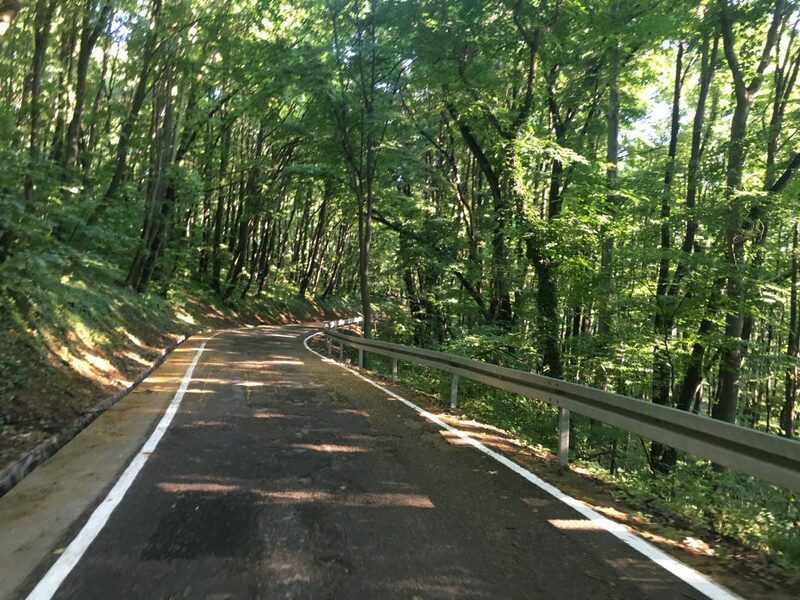 Where to ride your road bike in Belgrade? I must advise you to ask Belgradian friends of the road, as I only have spent very limited time exploring. Ask them, they will point you where to go as they did with me. Most of my rides I have done before work between 4 and 9 am. 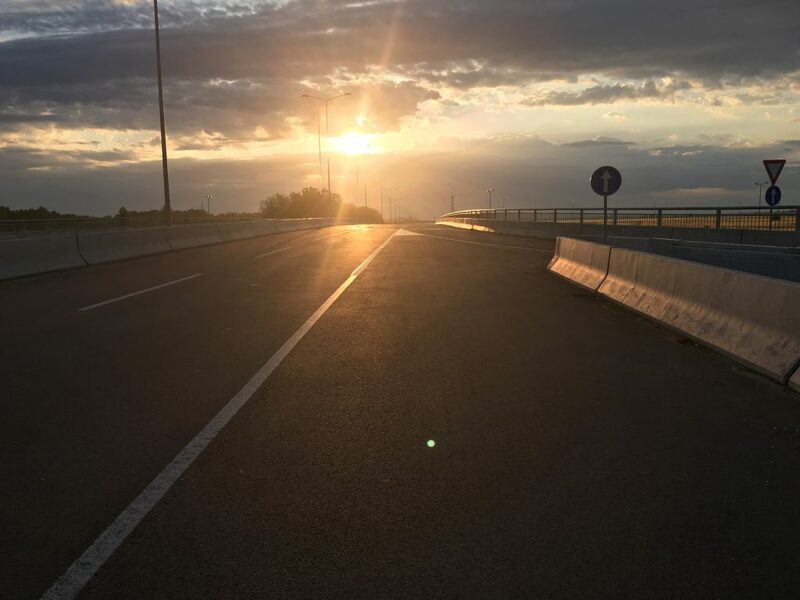 If you go for a ride that early you can ease in around Sava Lake. It is a bit too small for anything serious. One spin is not even 10 km and gets mental after a few rounds. …which is obviously not called the “Chines Road”. For time efficient km in the flat with around 55 km and close to no dog encounters, I recommend the “Chinese Road” around Belgrade. 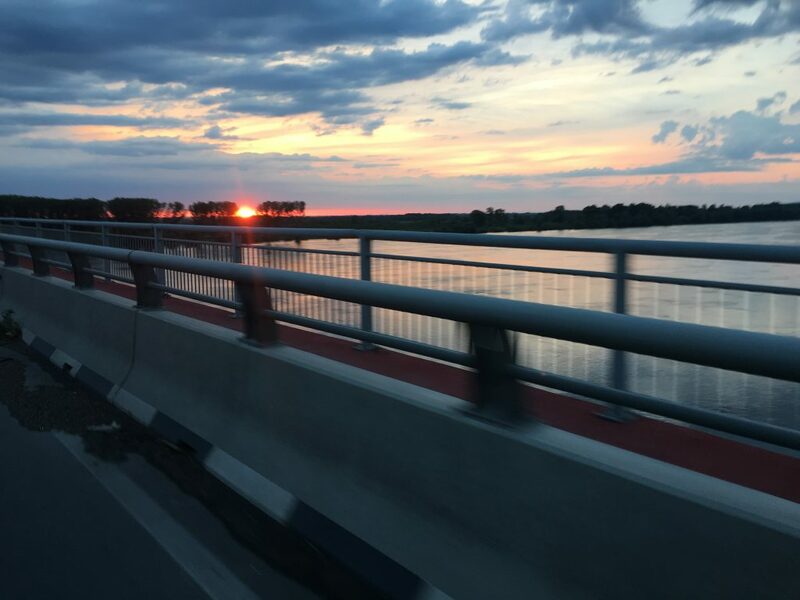 The “Pupin Bridge” crossing the Danube followed by the Most Mihajla Pupina was mainly financed by China. If you feel to add some elevation to your training schedule. Find the way to Avala from New Belgrade, around 85km and 1000m in Elevation for me. 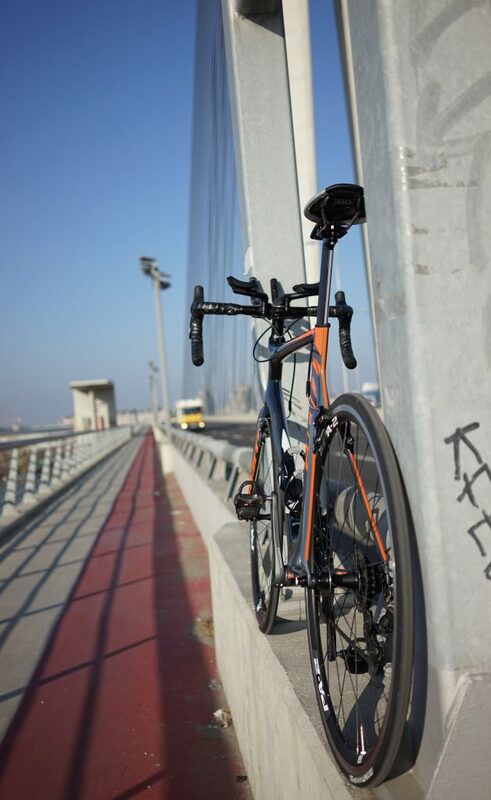 You have good chances for the whole package of “Road Bike Belgrade”. Thank you for hosting my rides and being mostly kind to me.